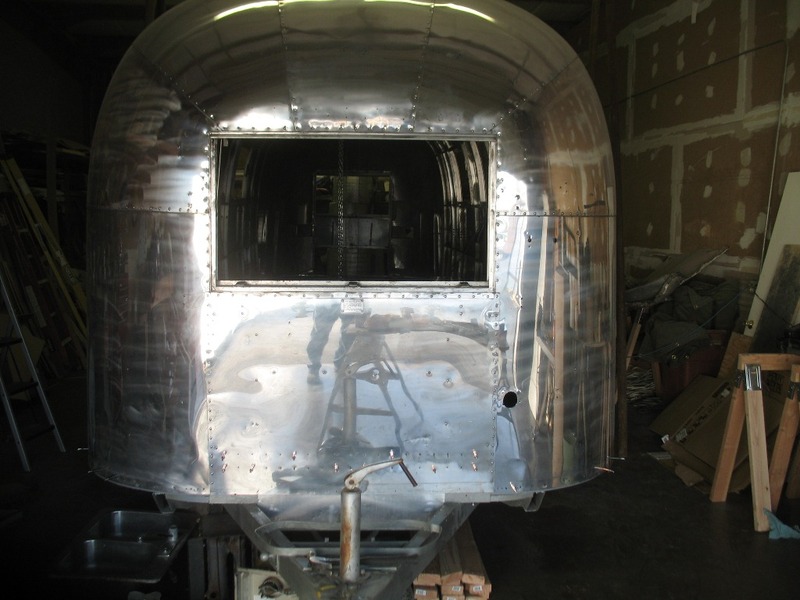 We have some really good friends that have been looking for an Airstream or Argosy for awhile now. They finally found a keeper about 500 miles away, so we went on a little adventure this weekend. 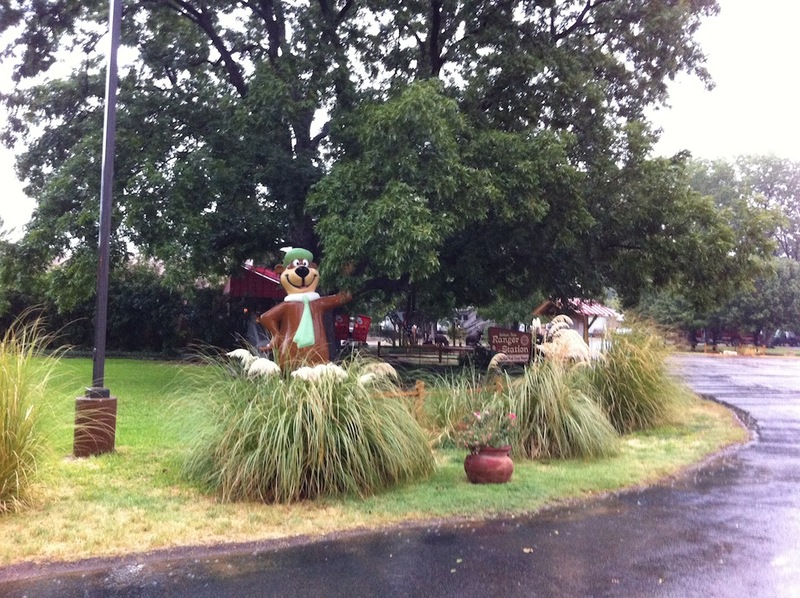 We headed up on Friday and stayed at the Jellystone Park at Rustic Creek Ranch in Ft Worth. This is the nicest Jellystone that we have stayed at yet, but only were able to stay one night. 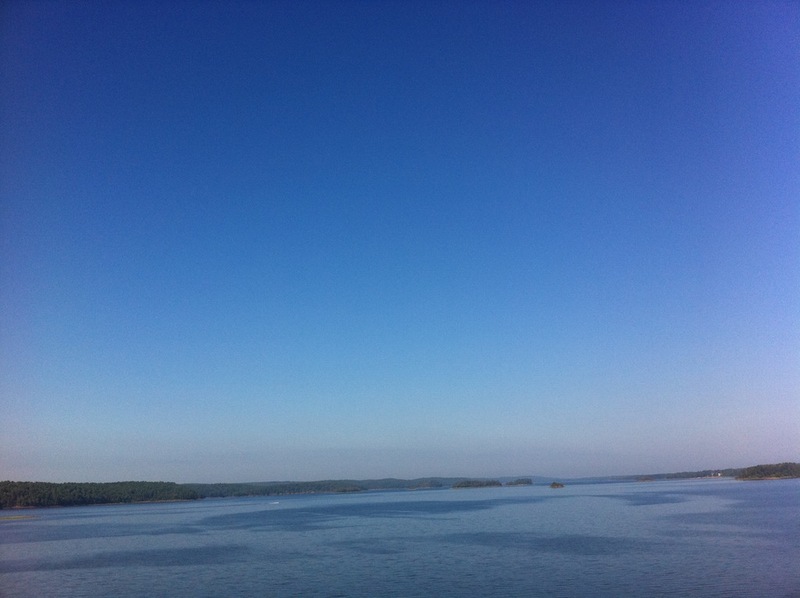 The next day we finished the drive to a small city south of Little Rock, AR. 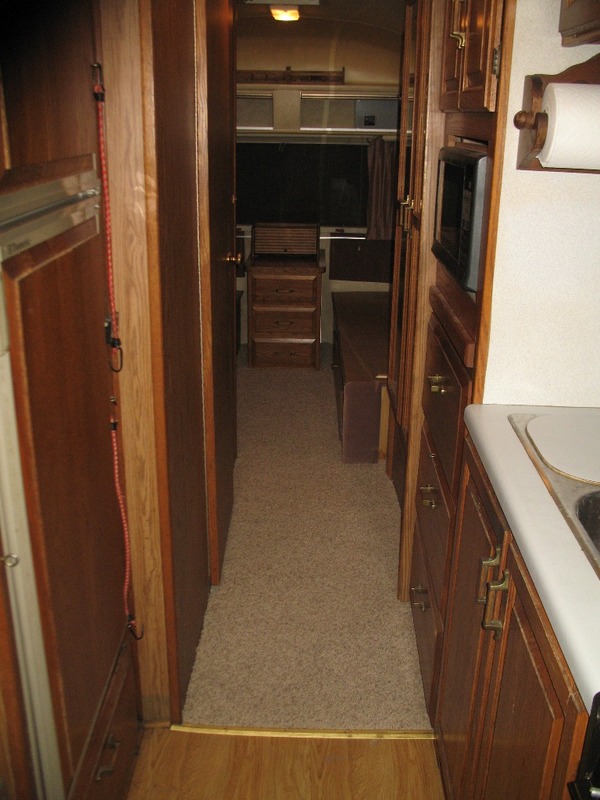 The 1976 Argosy 28′ was in incredible condition and simply perfect for our friends. 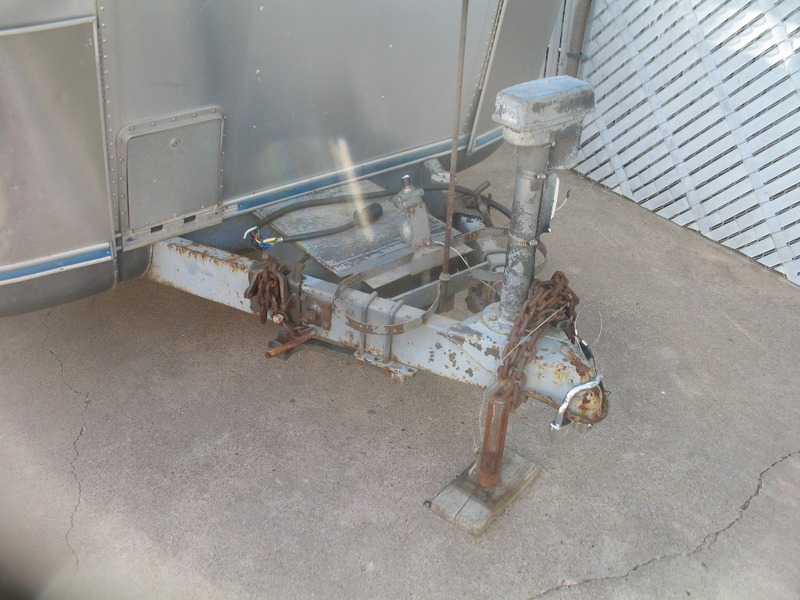 After a little looking over they bought the Argosy and we went on our way to DeGray Lake. We camped in the park that night and then got a chance to enjoy the woods a little the next morning before we hit the road. 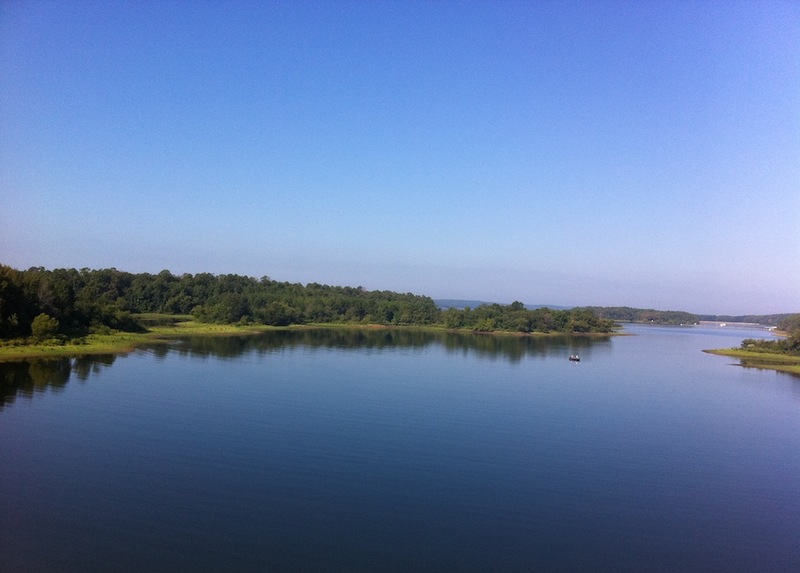 The lake is gorgeous and the woods were incredible. There is also a golf course at the park, so you could spend a 4 day weekend there and have a blast. 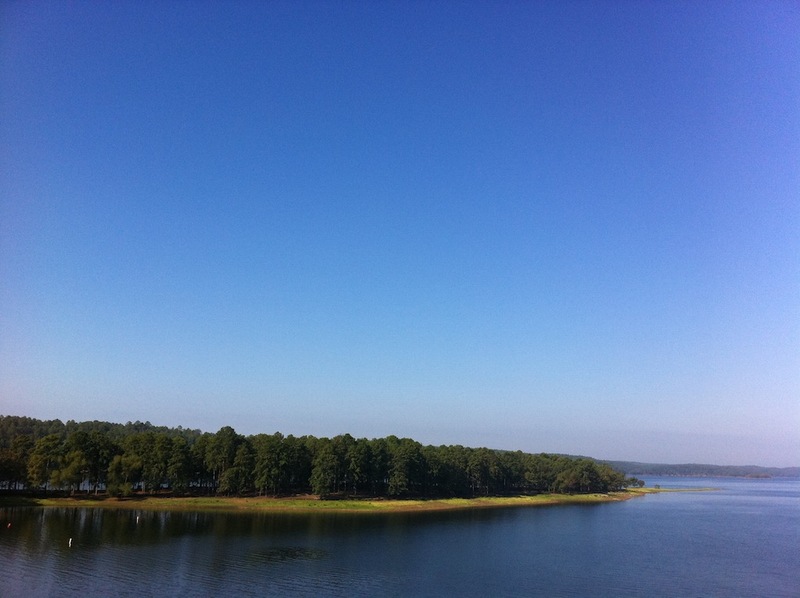 Here are some pictures that we took with our phone as we forgot to bring our “big” camera. The drive back home went without incident except for somewhere along the last 60 miles a rock went through the curb-side front wing window! 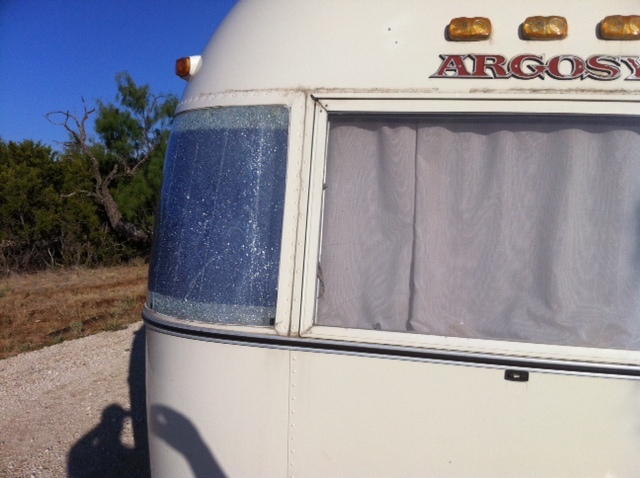 If you have or know of anyone with an Argosy wing window they would like to sell please let me know. Our friends really like the clear look of the Argosy’s factory windows, but the new replacements you can get today are all tinted. 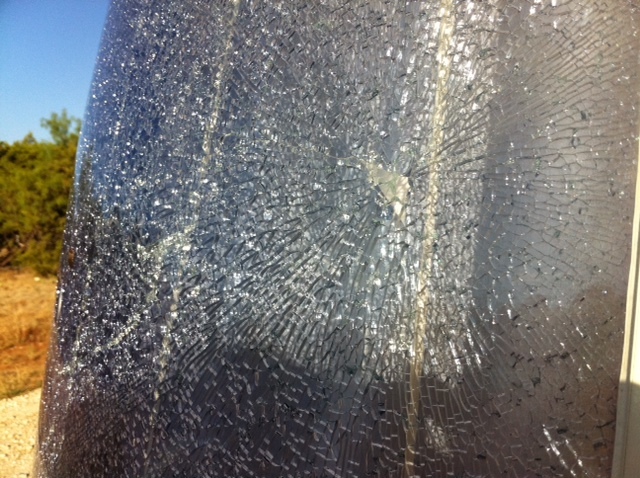 Now I am a big believer of a good rock guard. Well, we have been fairly busy since the last post. After getting the Excella ready, we went on our vacation to Colorado. The vacation was a blast and the Excella was incredible. We had to push really hard to get everything done before we left, but we got everything done and I have to say it was worth all of the hard work. 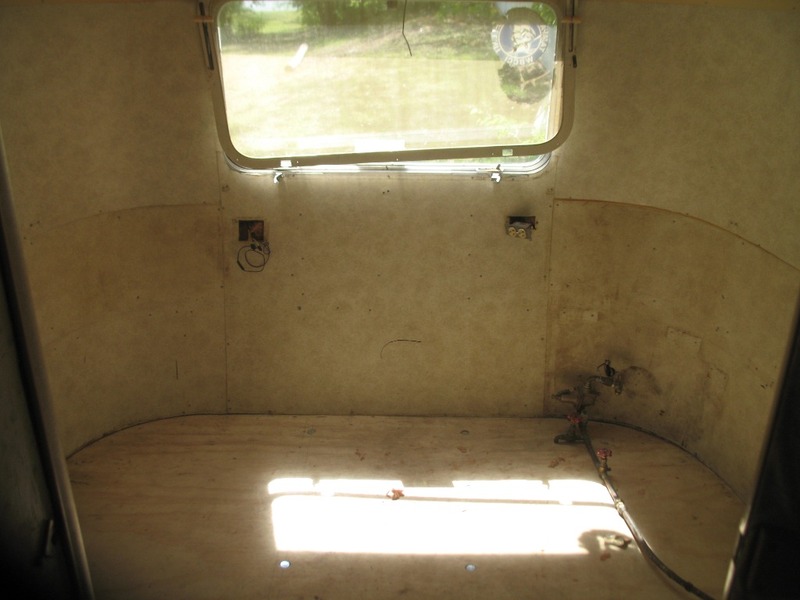 Here are some before and after pictures of the hitch. 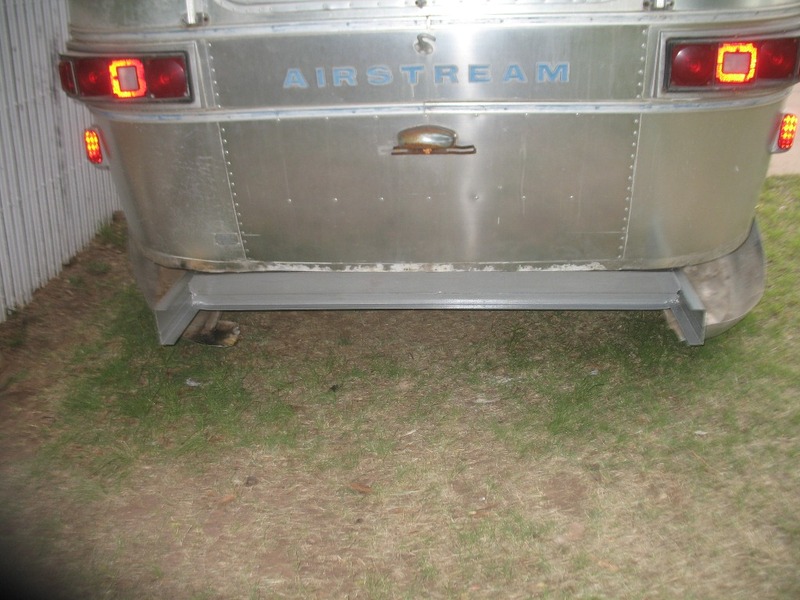 I also installed a Reese Dual-Cam weight distribution (800lbs trunnion bars) and anti-sway setup, which you can see in the shot of the trailer further down in this post. 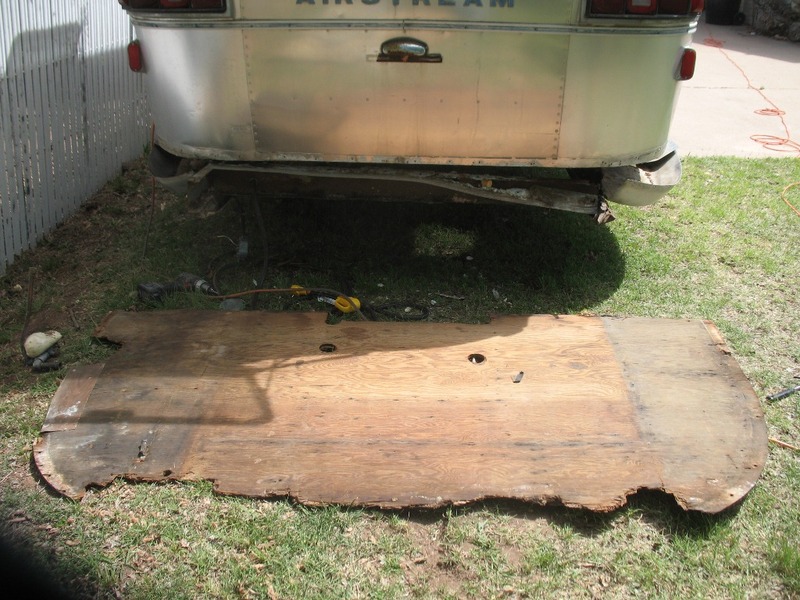 The hitch was in good condition and just had the normal peeling paint and some minor surface rust. I also rebuilt the coupler, so that is all new. 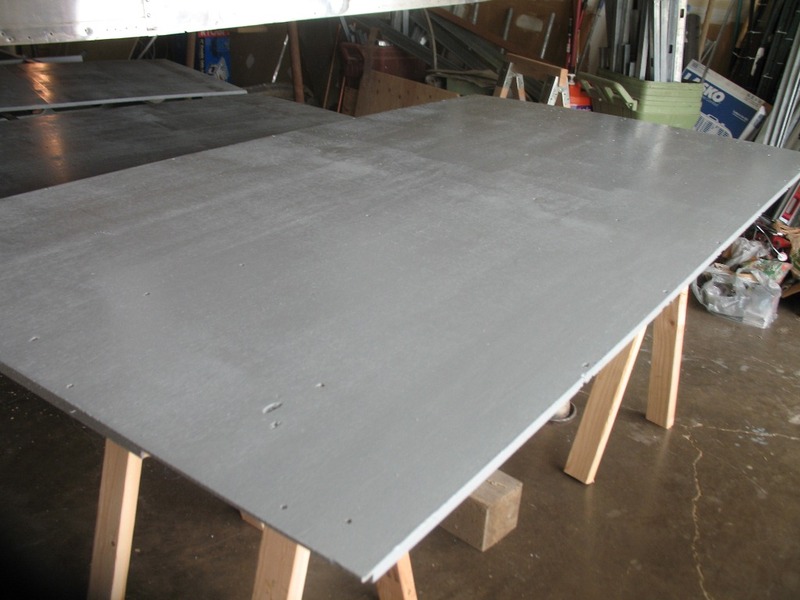 I applied two coats of gray POR-15 and then a top coat of the POR-15 sterling silver top coat. I also installed a new emergency breakaway brake controller. 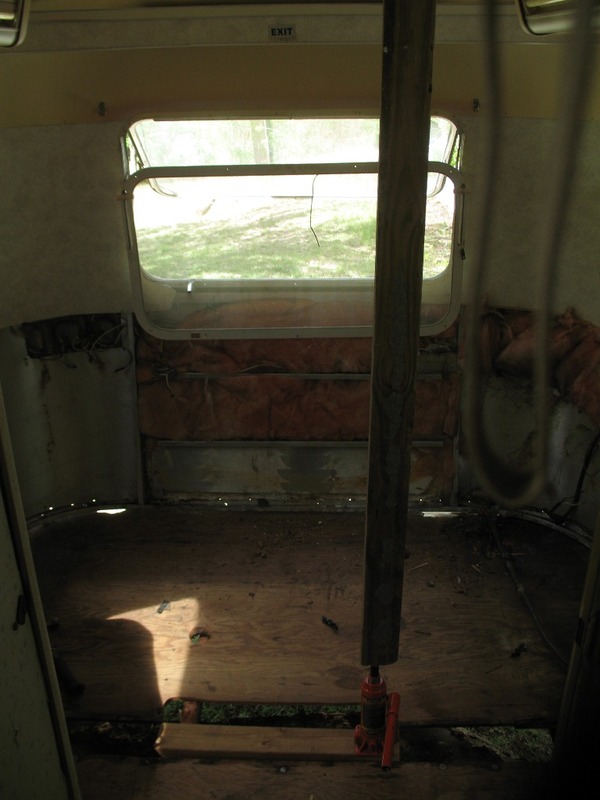 We also finished up all of the upholstery, which turned out extremely well. 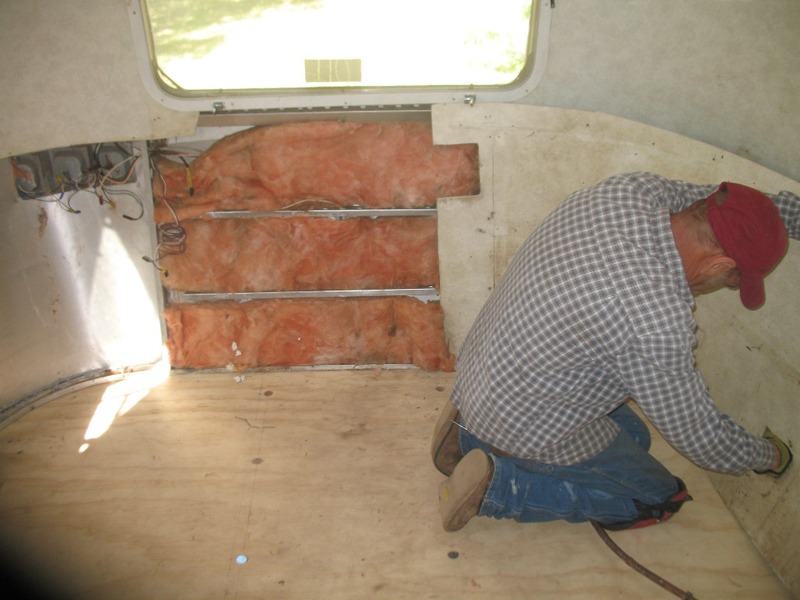 All of the panels on the bulkheads and the entire couch were reupholstered in a more modern fabric. We also spent much time sanitizing the foam and mattresses, but those are all now smell free and good as new! My wife did all of the sewing and I did most of the putting the fabric onto the parts. The seat portion of the couch took the most time and I have to say it all turned out very professional. You can’t really see the original fabric condition very well in these pictures, but it was stained all over with dark spots and in just horrible condition. 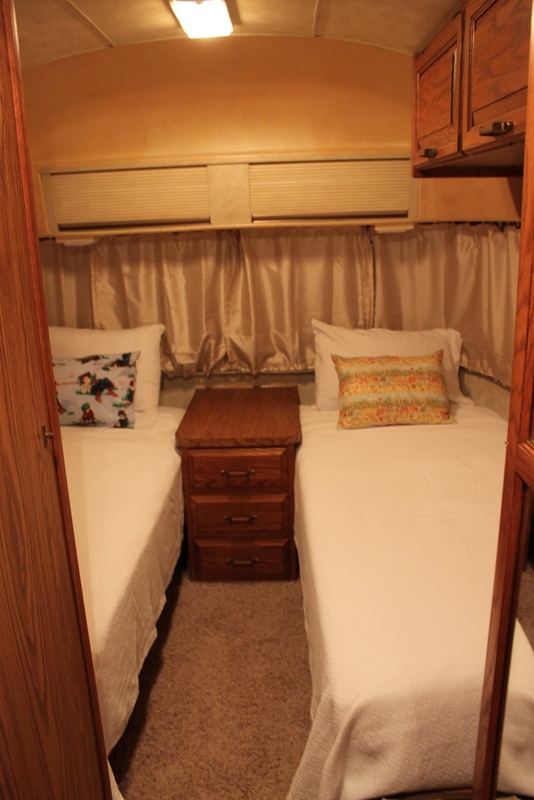 The curtains took an incredible amount of fabric and time to create, but turned out incredible. We used all new G and T sliders for the curtains. 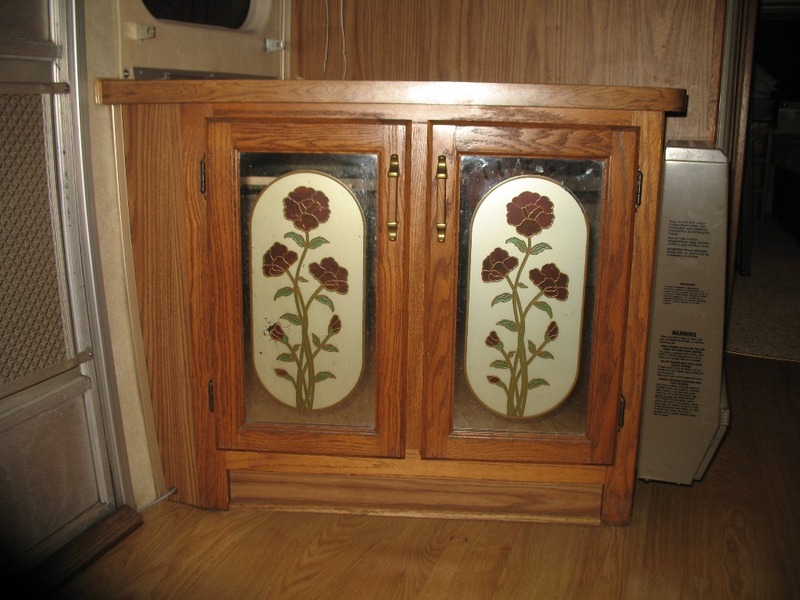 There is a small cabinet by the front door that had dated glass panels in the doors. 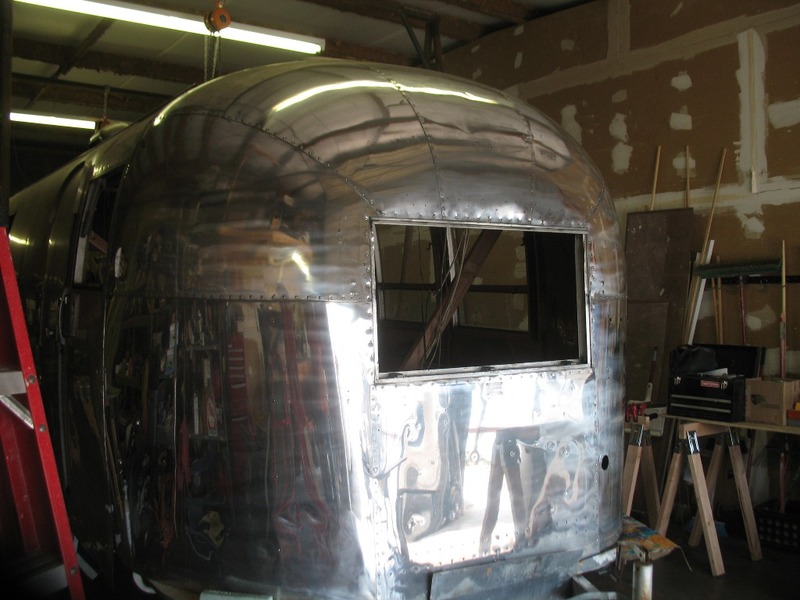 I replaced the glass with aluminum to bring some of the cool AS into the trailer and it also ties in with the more modern upholstery and carpet. You also can’t see it in the pictures, but I replaced all of the carpet under the beds and in the closet with the new carpet. 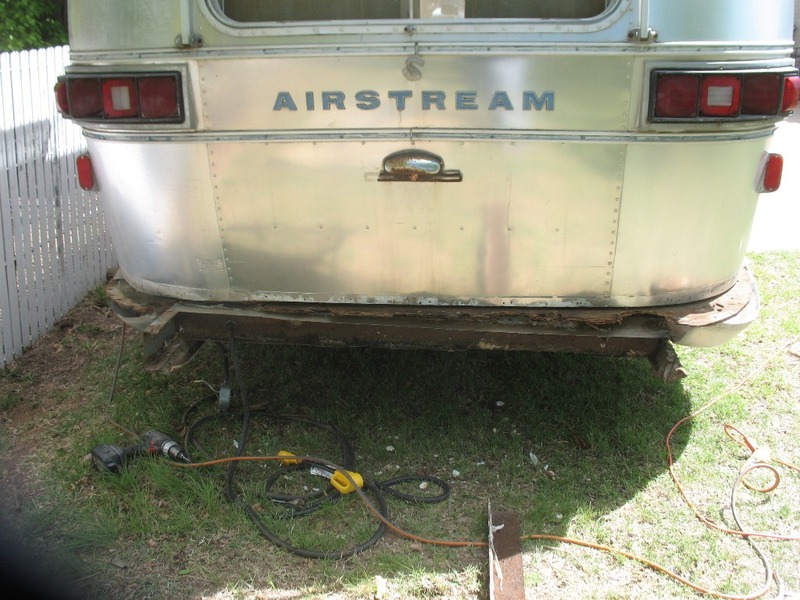 When I restored the hitch I had noticed that the main LP line had been crushed by the PO at some point under the a-frame. I replaced the entire section of main LP line up to the T and installed a brand new regulator. I leak tested everything and had no leaks! 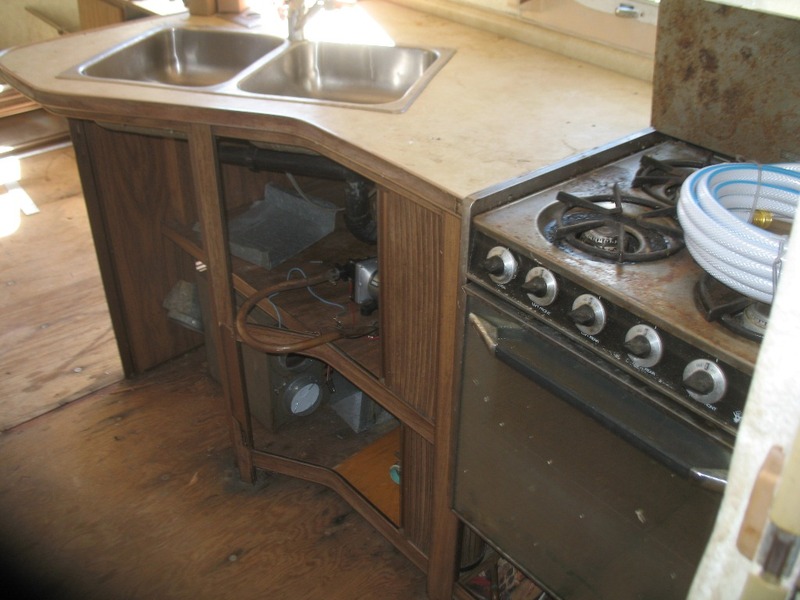 I had been having some issue with the fridge operating off of LP, but the electric operation worked perfectly. I talked to some guys and it was recommended that the thermocouple was bad. 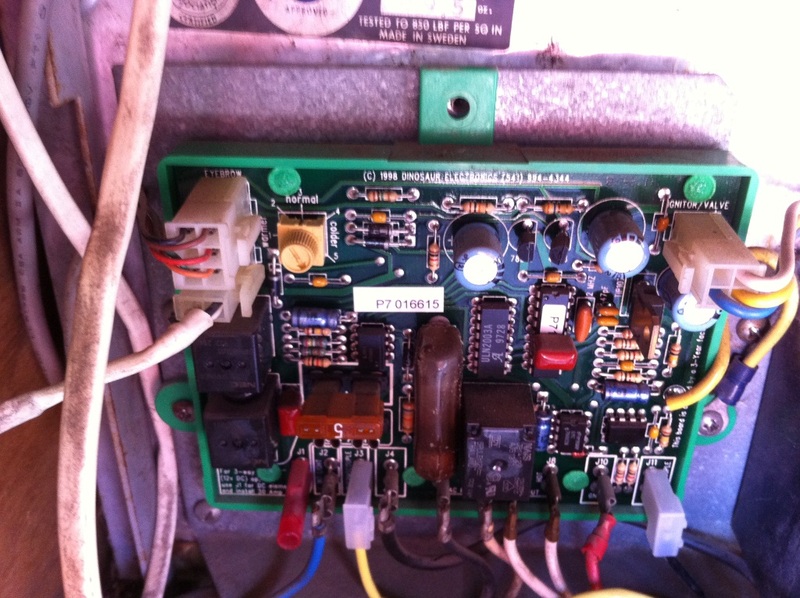 This fridge has an odd thermocouple with the electrical connections, but after ordering one online I found that the problem of the pilot light staying lit was still there. I decided to replace the control board with a new Dinosaur Electrics P-711 board and that fixed the issue! The fridge now operated perfectly on both AC and LP. It took us until about midnight the day before we were planning on leaving to get everything finished, but we got it done. We then left on a 9 day trip to Colorado! 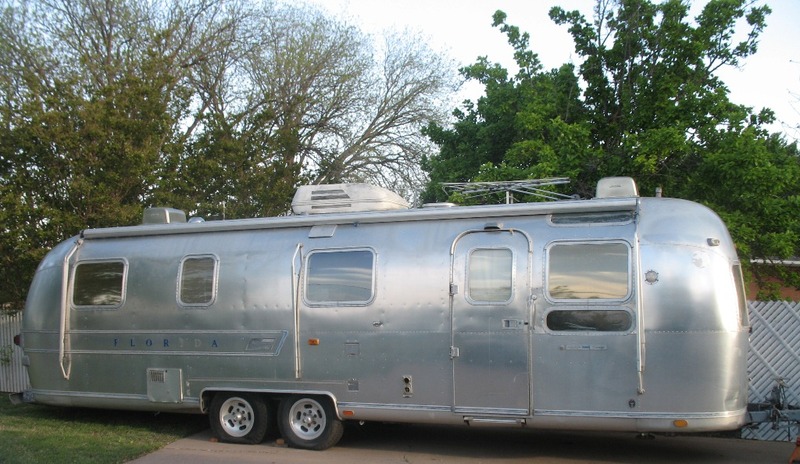 The trailer pulled like a dream the 2150 miles we pulled her to and from Colorado. 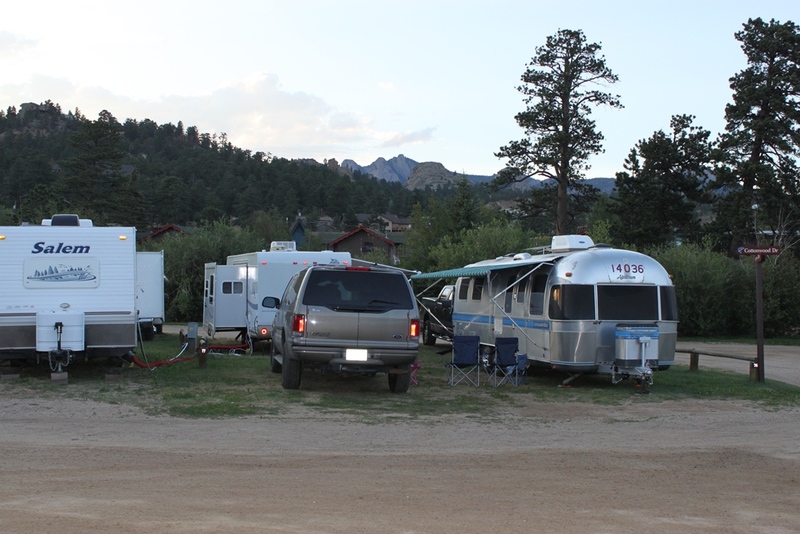 We stayed at a Jellystone RV park in Larkspur, CO that we would highly recommend if you have children. 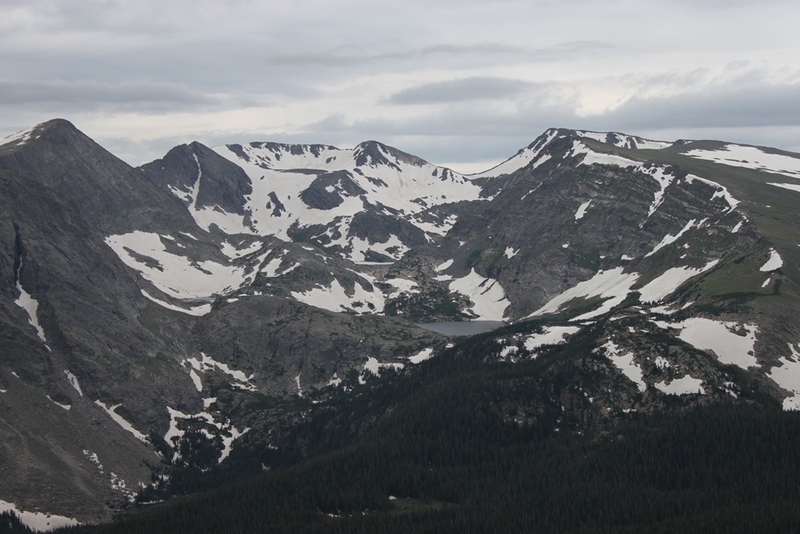 Next we visited my best friend in Denver and then made our way to Estes Park, which was our main destination. 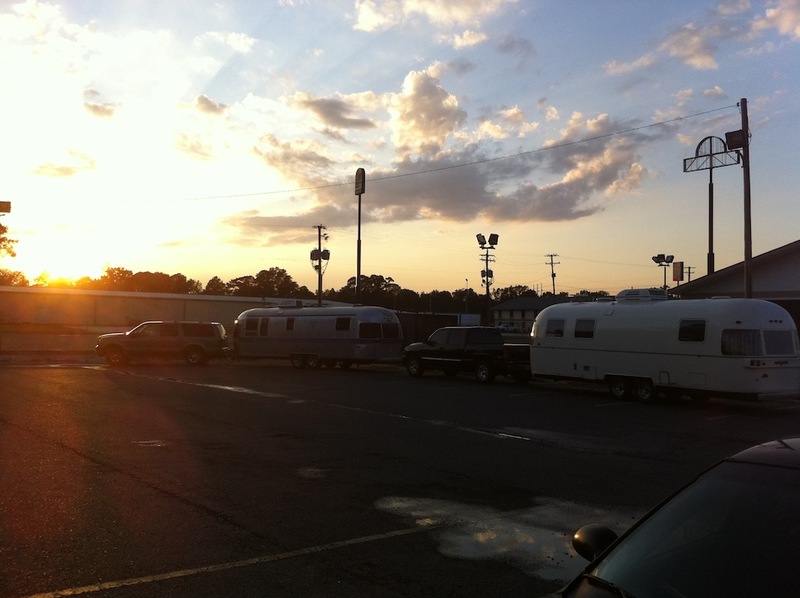 We stayed at Spruce Lake RV Park and I can’t recommend this place highly enough. This RV park is amazing and we could have stayed another week and still not have been ready to leave. We were feet away from the Big Thompson River and a few hundred feet away from Spruce Lake. 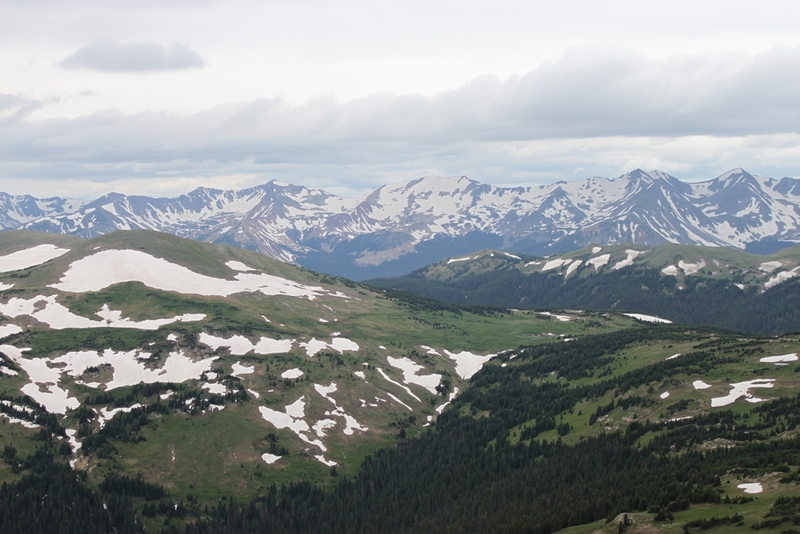 There were mountains 360 degrees and simply beautiful. Finally we made our way to Mountaindale Cabins & RV Resort outside of Colorado Springs as our base camp to go explore Royal Gorge. 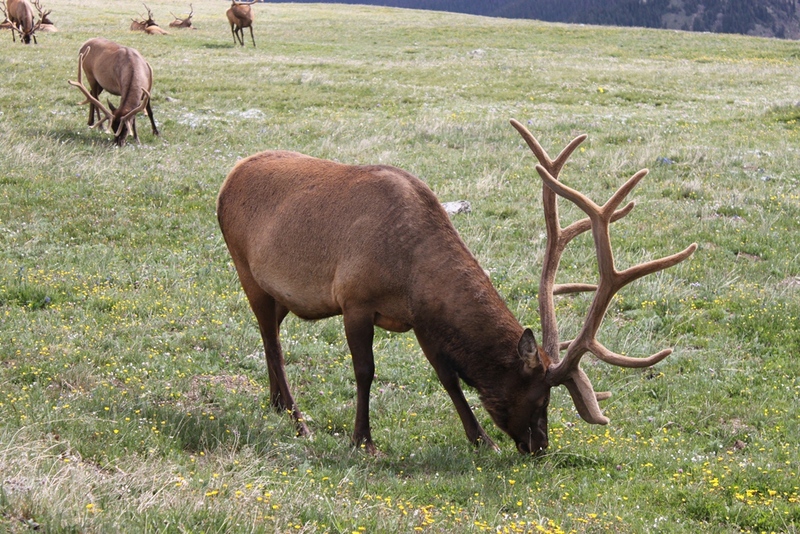 Anyway, here are some pictures from our time in the Estes Park area. We have an Excursion as our TV with the dinky side mirrors. 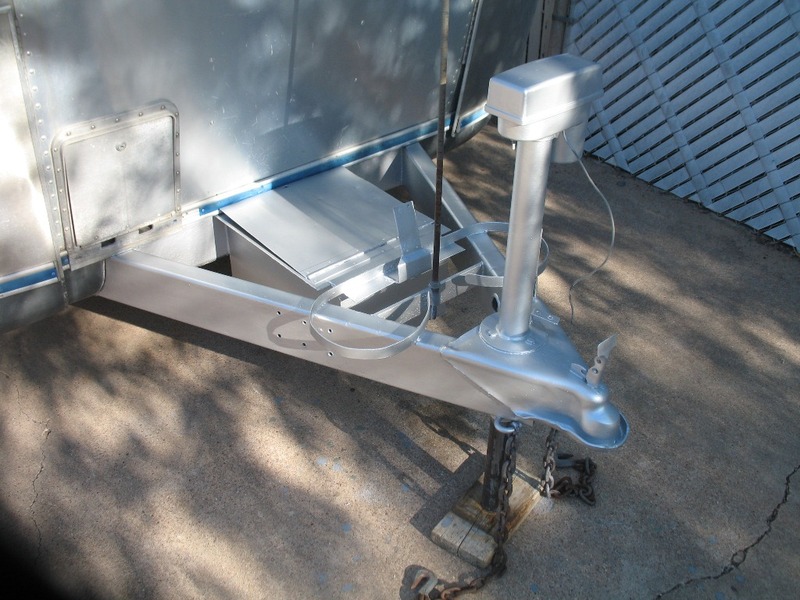 I read a lot of good things about the Camco Tow-N-See mirrors and decided to give them a try. Short of getting the new type of OEM mirrors that have the electric extender, these are perfect. They stayed on our entire trip and it was so nice to be able to adjust them with my normal electric controls. They didn’t vibrate either, as hard as it is to believe! I used a flat for the driver’s side and a convex for the passenger side. The trip was a huge success and the Excella was even better than we had anticipated. We drove in the plains, high winds, mountains, rain, daytime, and nighttime and had no issues at all. The Reese setup worked great! 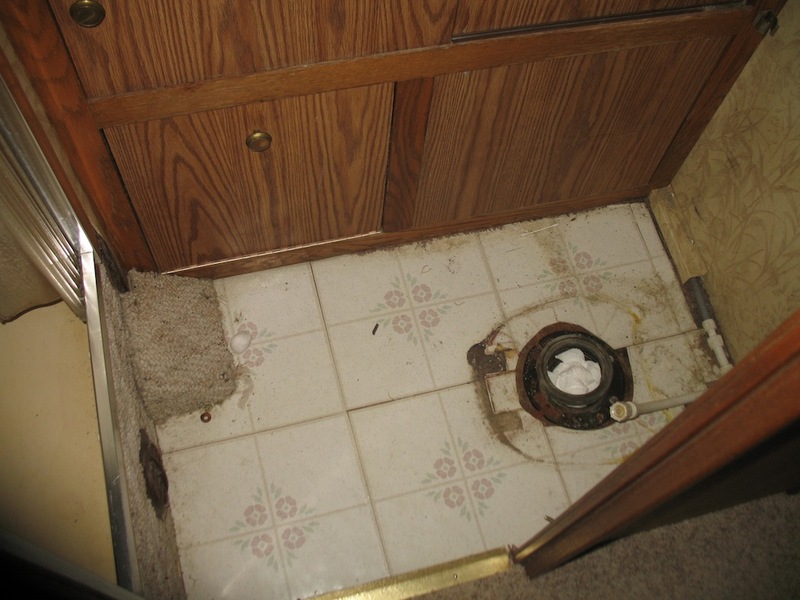 I also should mention we used the Sewer Solution and highly recommend it. I had no leaks, no smells, and could do all of the handling with my bare hands. It was really all that it advertises. You can get a pretty good deal on these on ebay if you look. 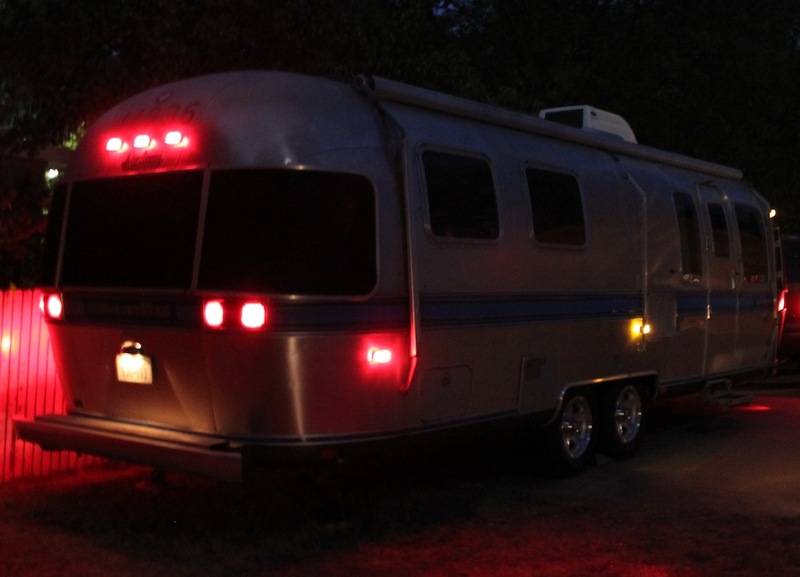 The running lights had a short in them when we first picked up this trailer. I examined each light and although they looked to be wired correctly with no exposed wires, the plastic bases were deteriorating so badly that pieces would simply fall off trying to remove a bulb. 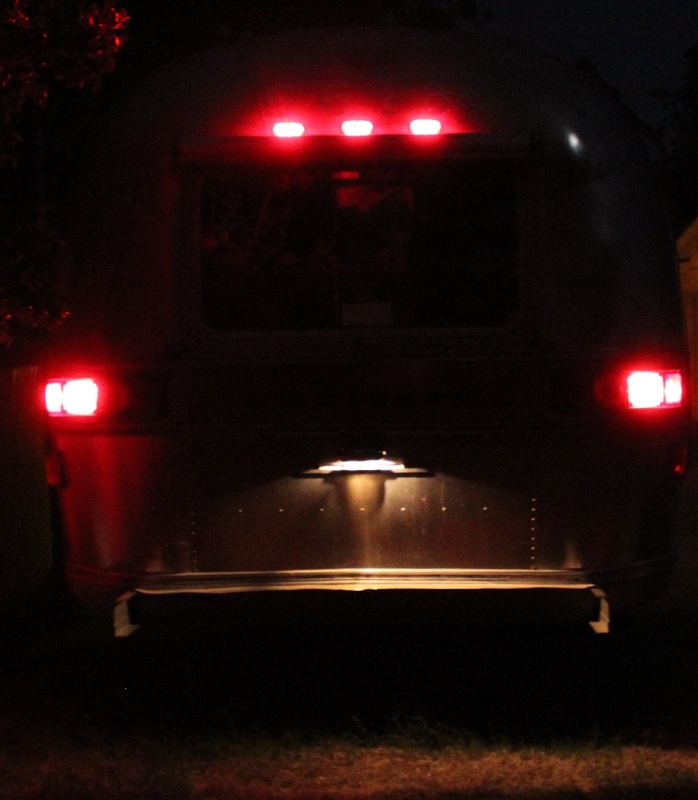 I decided to install all new LED running lights since that would take less time than trying to find the short. Once I removed the lights the short went away, but there was still power loss. 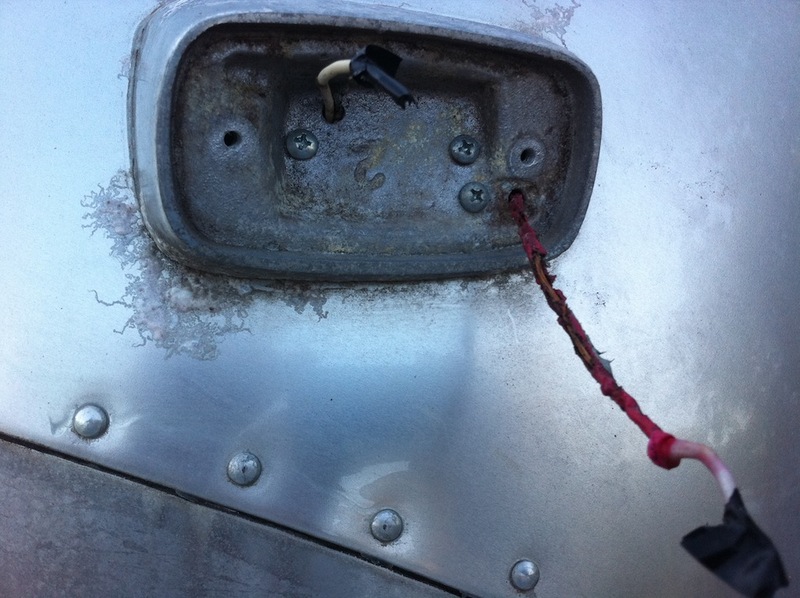 I prepped each area for the new lights and then discovered the cause of the short…a very exposed wire. After removing the damaged portion of the wire there was no further power loss! 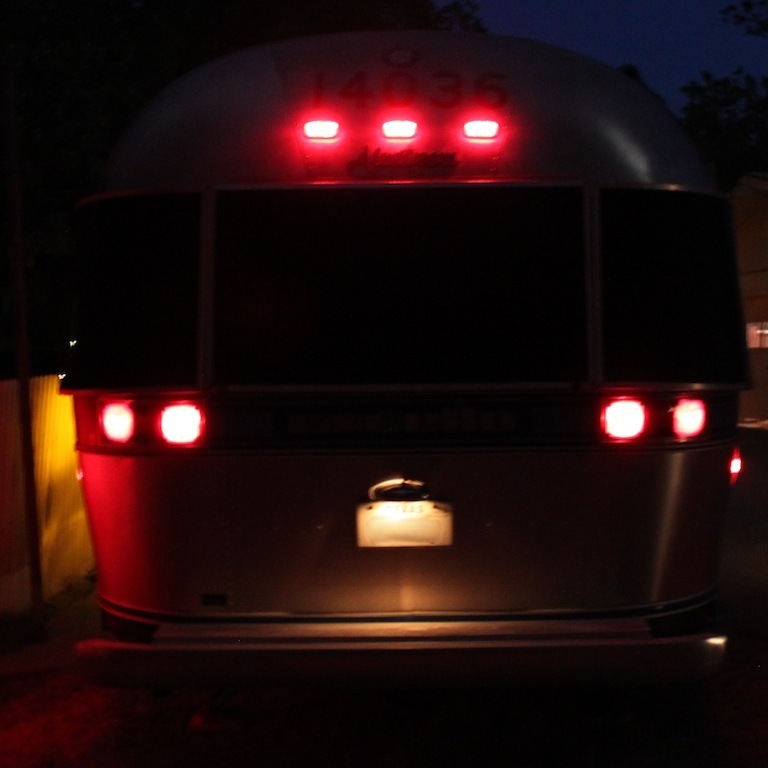 I purchased the same LED lights that we used on the ’77 from superbrightleds.com. The proof is in the pudding as they say. Last week we installed the new axles, shocks, wheels, and tires on the 1988 Excella. The old axles had a permanent negative arm position even when jacked up off of the ground. The old tires and wheels are in pretty good condition, but we decided to upgrade to new 16″ HWT series 4 aluminum wheels and BF Goodrich Commercial T/A All Season E rated tires. 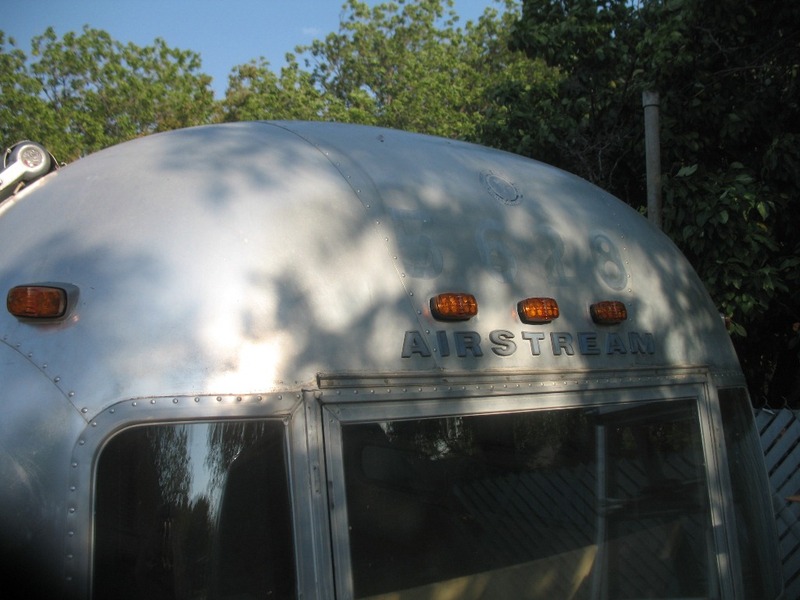 These tires have lasted other Airstreamers for 80,000 miles without any issues, which is better than all of the 5,000 mile Goodyear Marathons that everyone has issues with. 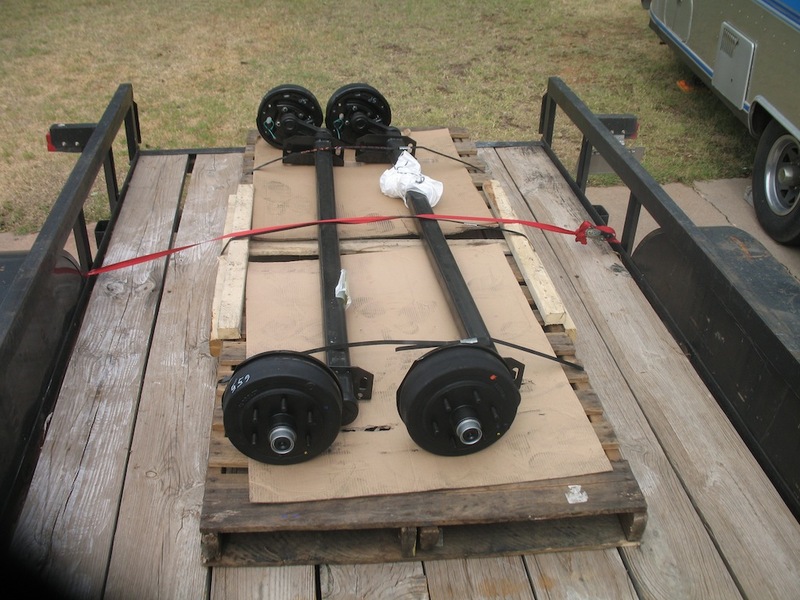 The axles were manufactured by Axis and got a little increase from the factory 3200lbs rating to 3500lbs. New OEM Gabriel shock absorbers were also installed. 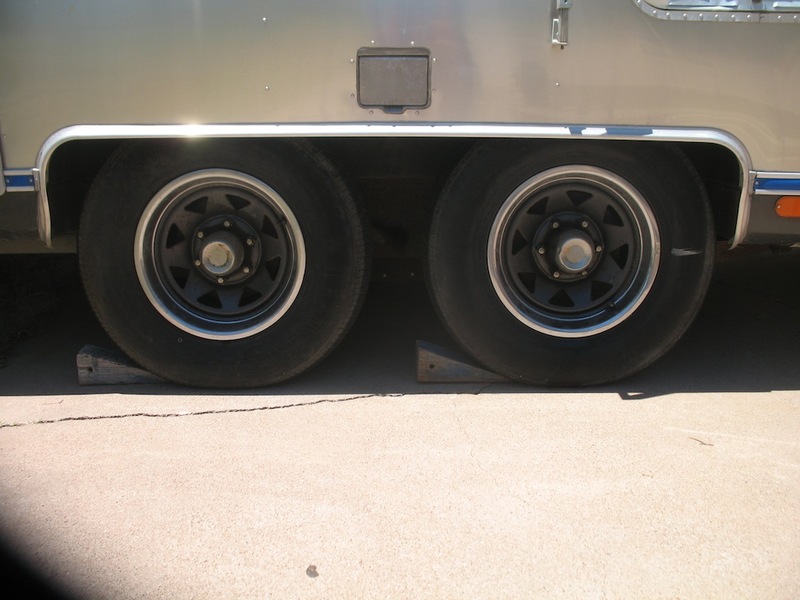 We gained about 3″ with the new axles, wheels, and tires. I also installed the brand new Carrier 15,000BTU heat pump. 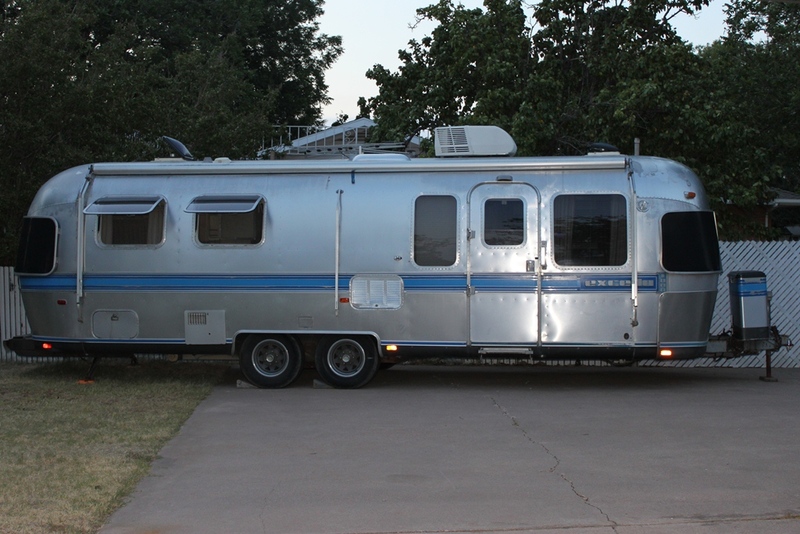 This unit works great and looks really nice on this trailer. I could not find a low-profile unit, but this one is only about 3″ taller than the low-profile unit. 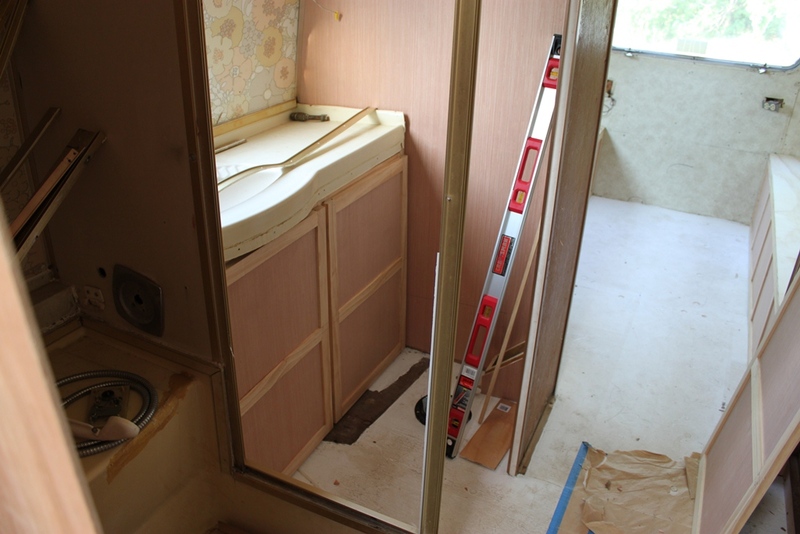 I had a new toilet sitting in my garage for the ’77 project, but after more thought I couldn’t pass updating this trailer’s bathroom. I removed the old tile and installed new linoleum tile that has a slightly more updated look. 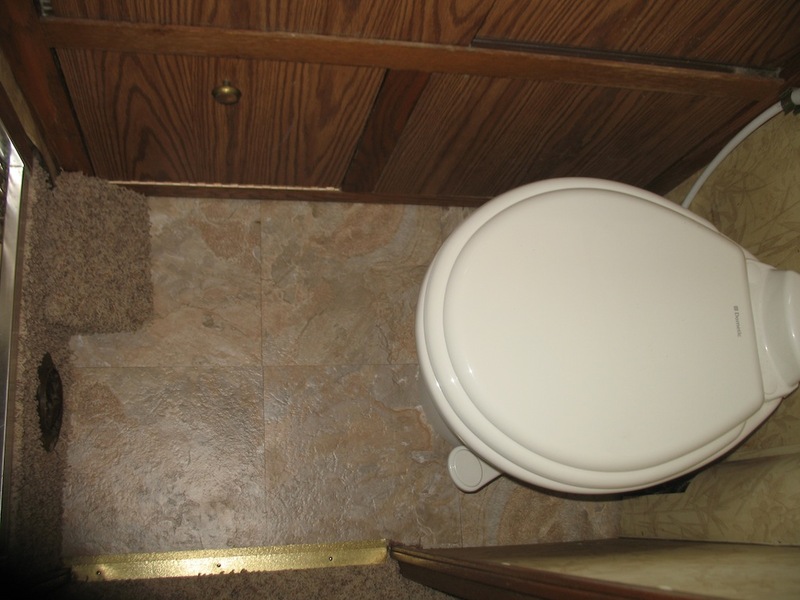 The carpeted pieces in front of the shower were recovered and finally the new Dometic toilet was installed. What a difference and it will be MUCH easier to clean around this toilet. 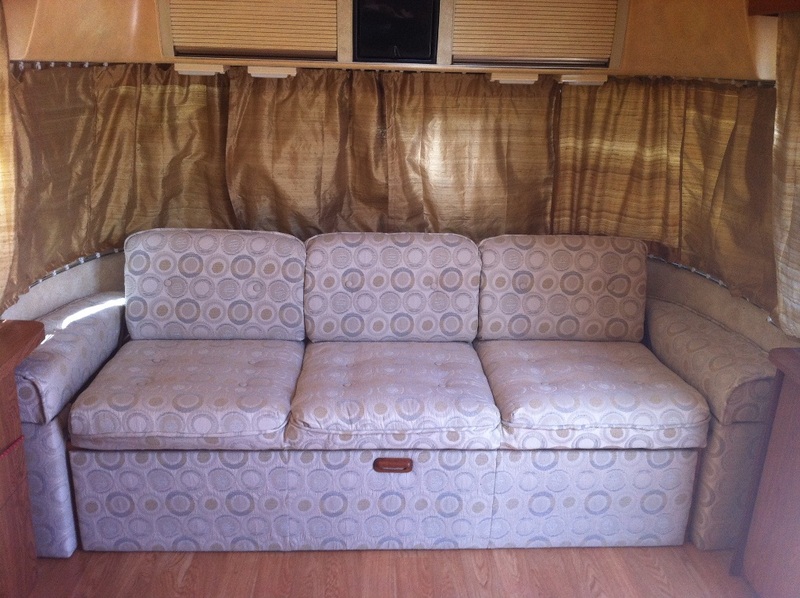 My wife has been busy completely redoing all of the upholstery. I believe everything is now ready to be installed and hopefully we can get that done over this weekend. 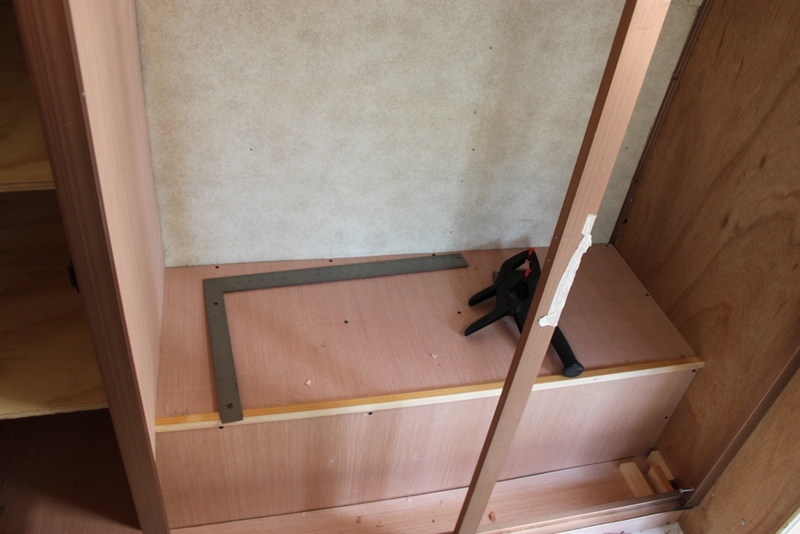 There are several other small projects for next week, but we almost have this trailer ready for action! 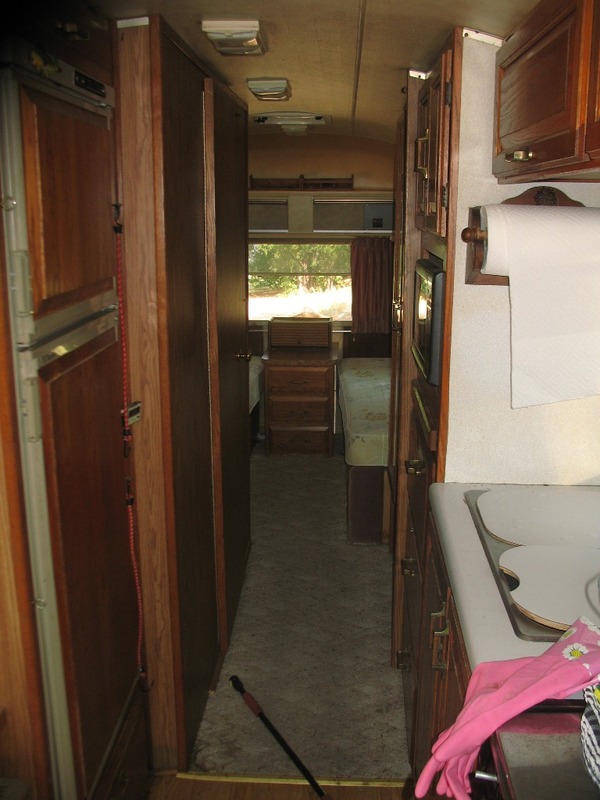 Several months ago we looked at a 29′ 1988 Excella in excellent condition. We were not able to come to an agreement on the selling price with the seller so we left our number and drove home. 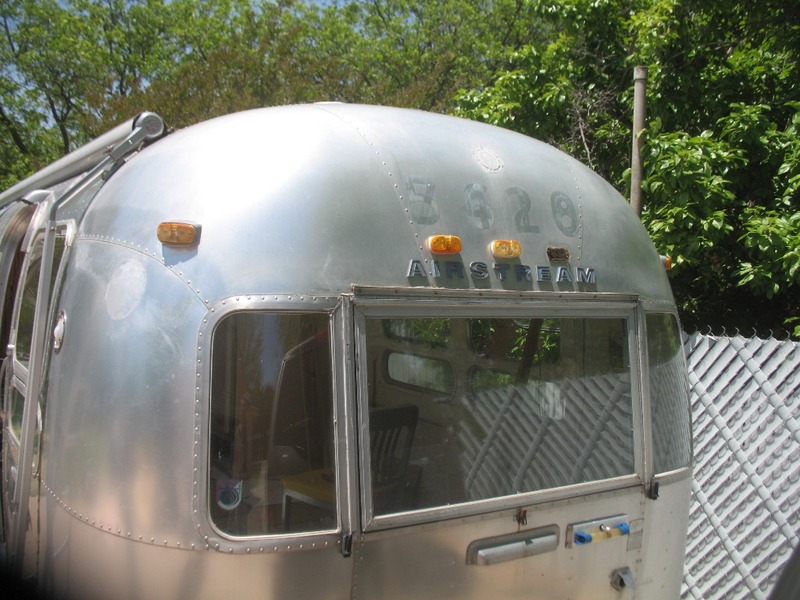 Last week I got a call from the seller saying they were ready to sell for my price so we now own a new Airstream. 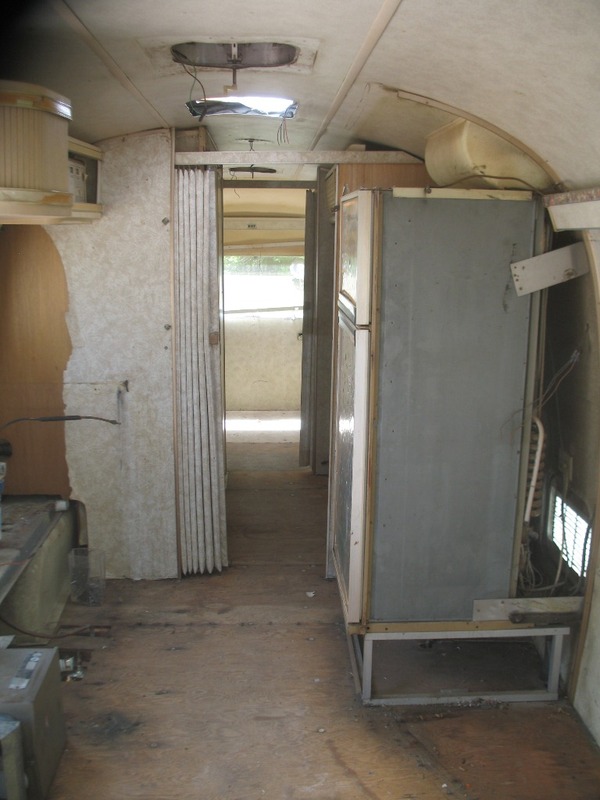 This trailer is in incredible condition! 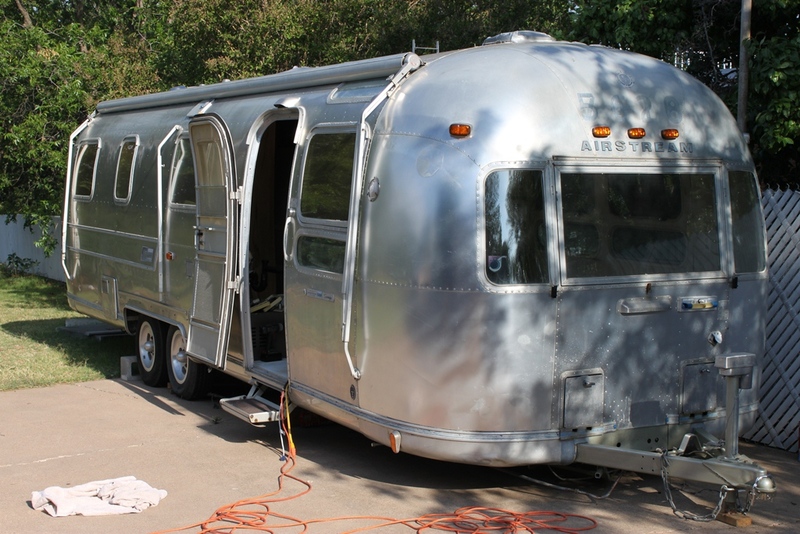 The only things wrong are that it needs new axles, A/C, the running lights blow a fuse on my tow vehicle (short on this trailer somewhere), some of the pin striping is peeling, and of course some clear coat is also peeling. Considering the age of this trailer that list is minor! The axles that I ordered for the ’77 finally arrive tomorrow and they are actually the exact axles that the ’88 needs. 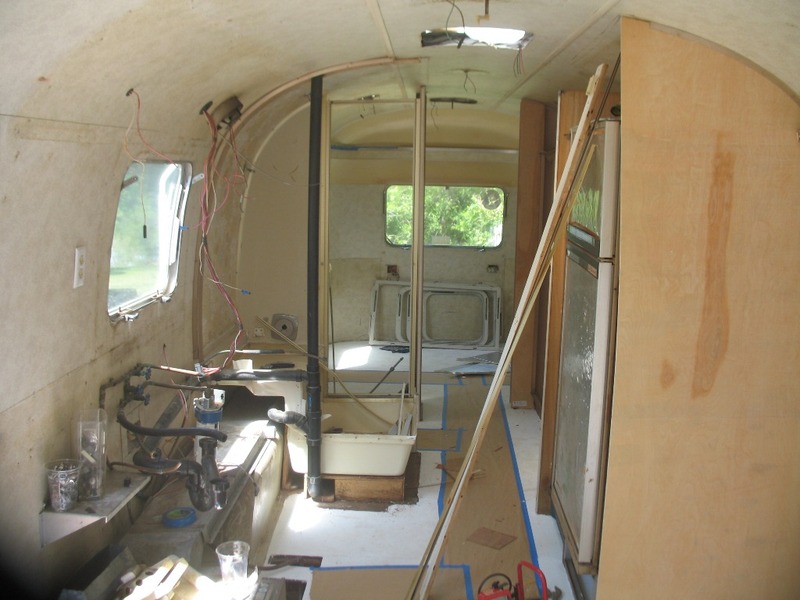 We are going to install those axles and the new Carrier A/C heat pump that we have sitting on my workbench in this new trailer this week. 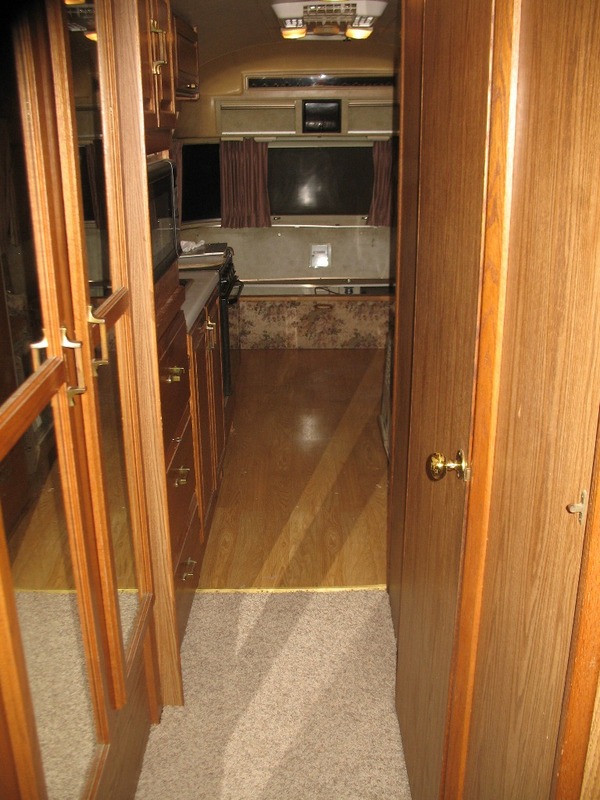 We spent several hours on Saturday cleaning up the trailer and went ahead and replaced the carpet in the hallway and rear bedroom. 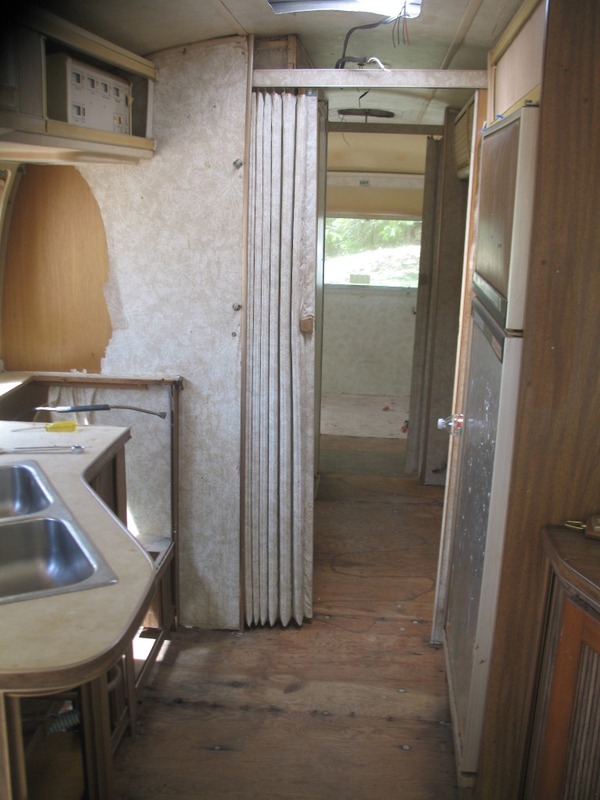 The kitchen and living room have wood floors that are in excellent condition. 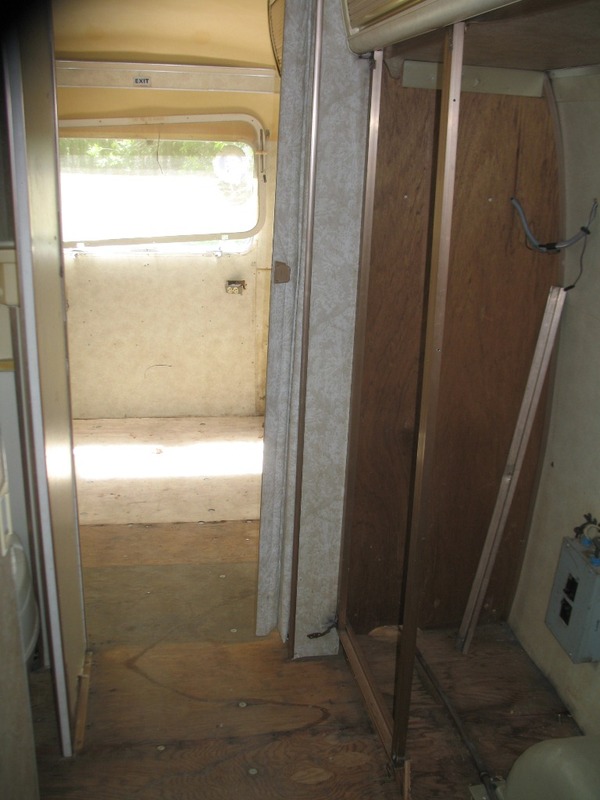 The first picture is of the carpet as of the time we bought the trailer. Here are the finished pictures of the new carpet, minus the trim that I still need to install around the floor. 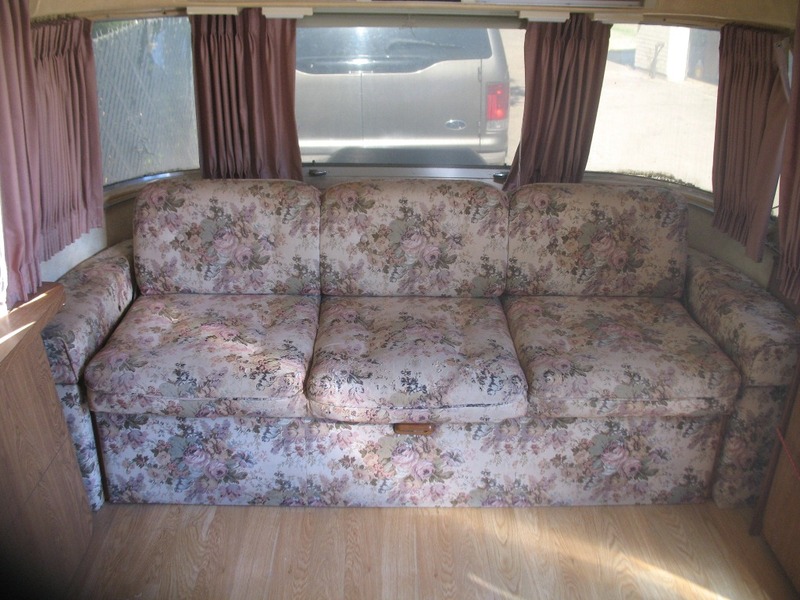 You will also see that I have removed the couch and bed mattresses as we are in the process of airing everything out and my wife has ordered new upholstery fabric to recover the couch. The curtains will be coming out as well as the upholstered panels, but we haven’t decided if any of the upholstered panels will be going back (except for the one behind the couch). 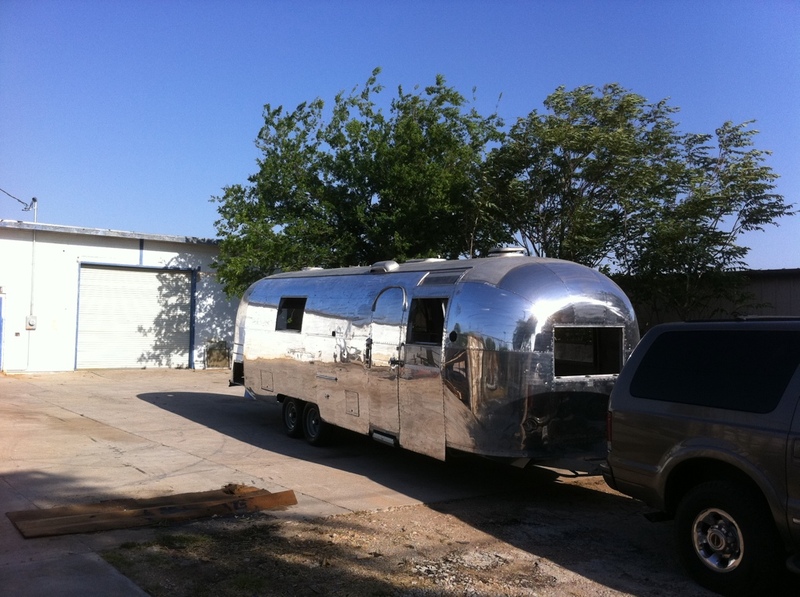 Later this summer, we plan on selling this trailer. Please let me know if you are interested! 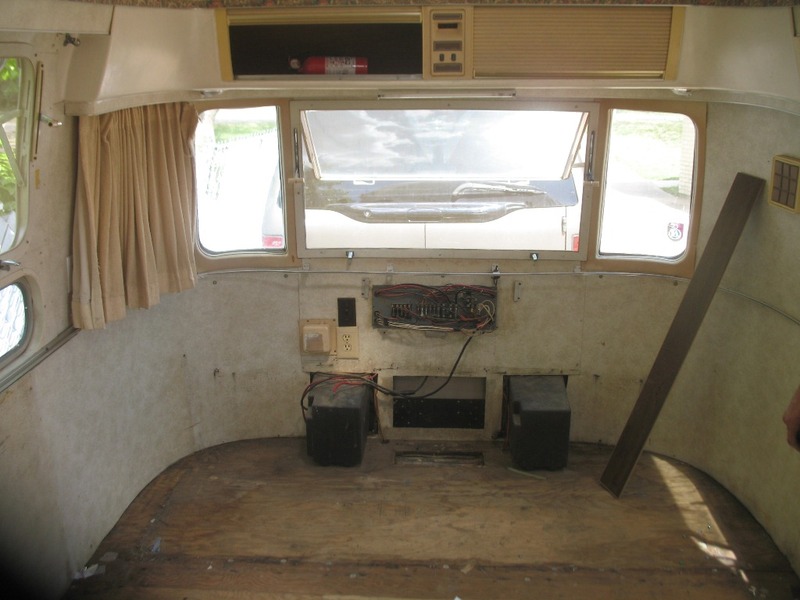 The inside of the ’77 has really been getting some much needed updating over the past few months. 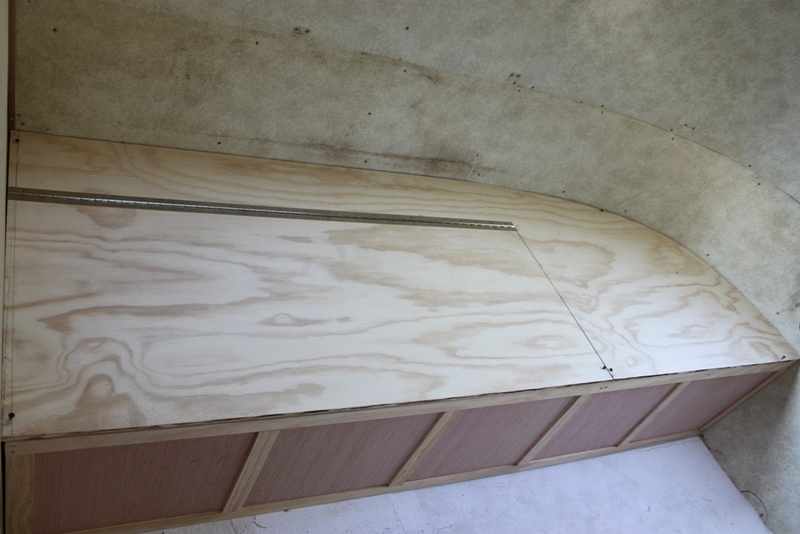 We are building all new beds, cabinets, shelves, couch, and bulkheads. 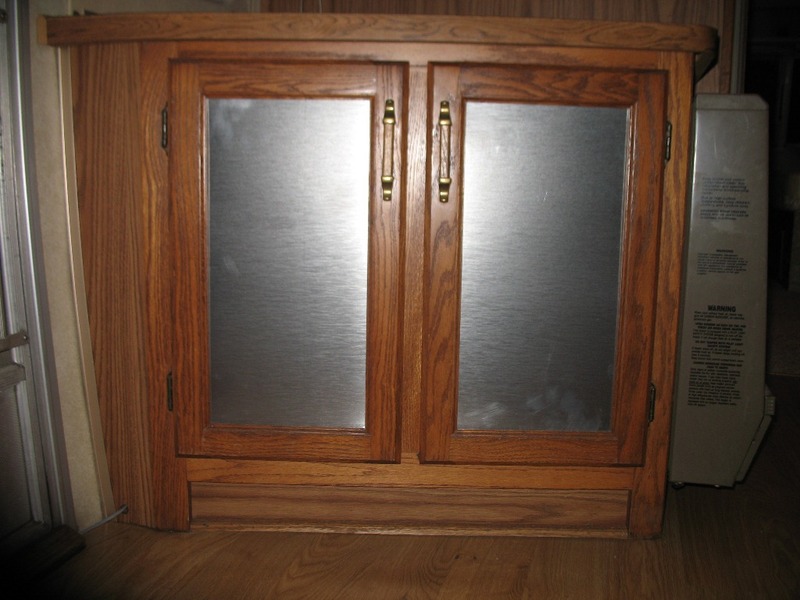 We are using a shaker style for the cabinets. The walls will all be painted a slightly off white color while the cabinets will be a gray. 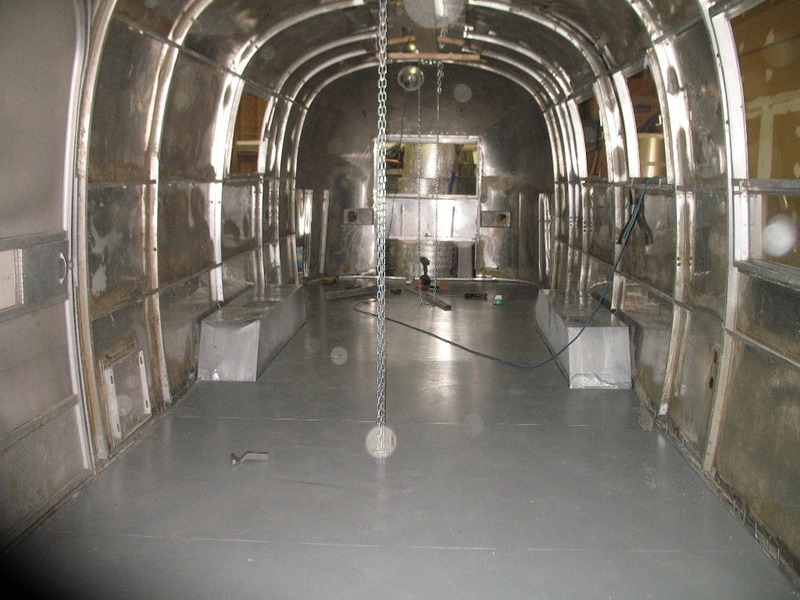 All of the paint was bought at Sherwin Williams and we are using their adhesion primer that will bond to everything in the trailer. I have already tried it on the window screen frames and it worked incredibly well. 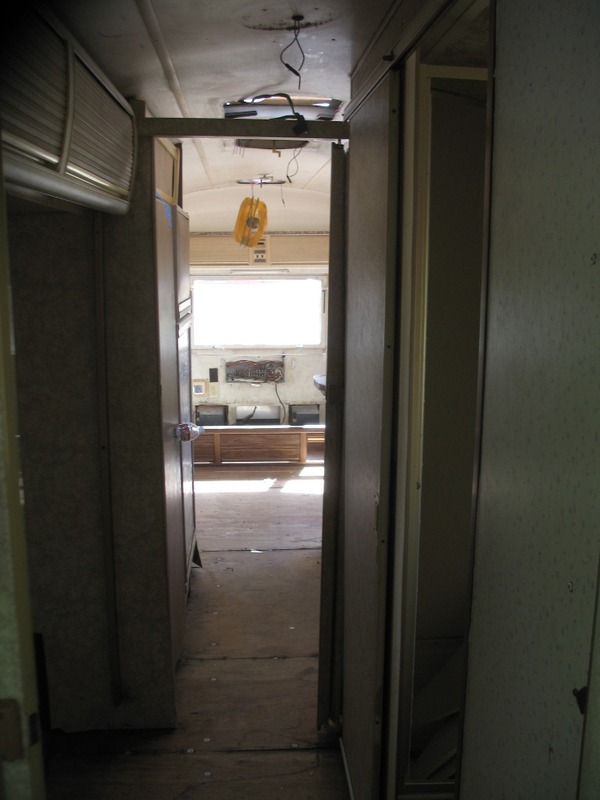 We removed almost everything from the interior with the intention of rebuilding with the same basic layout. 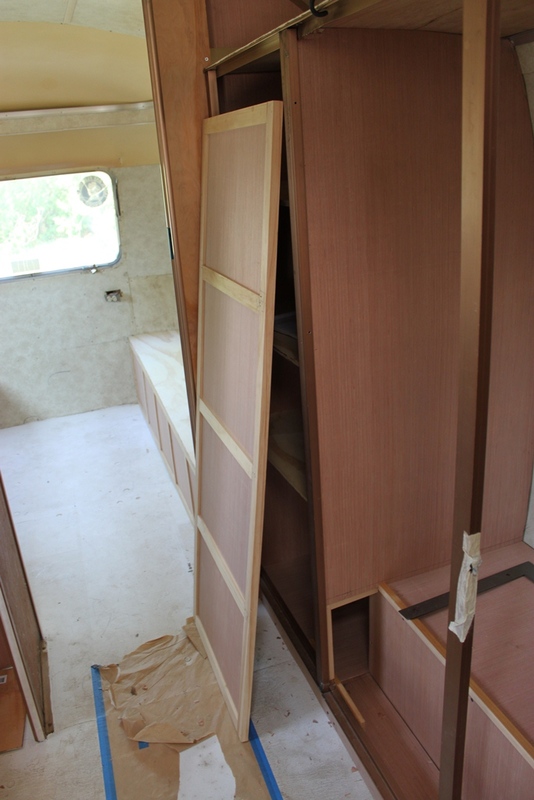 The kitchen cabinet will be slightly different than originally, but for the most part the same basic layout. 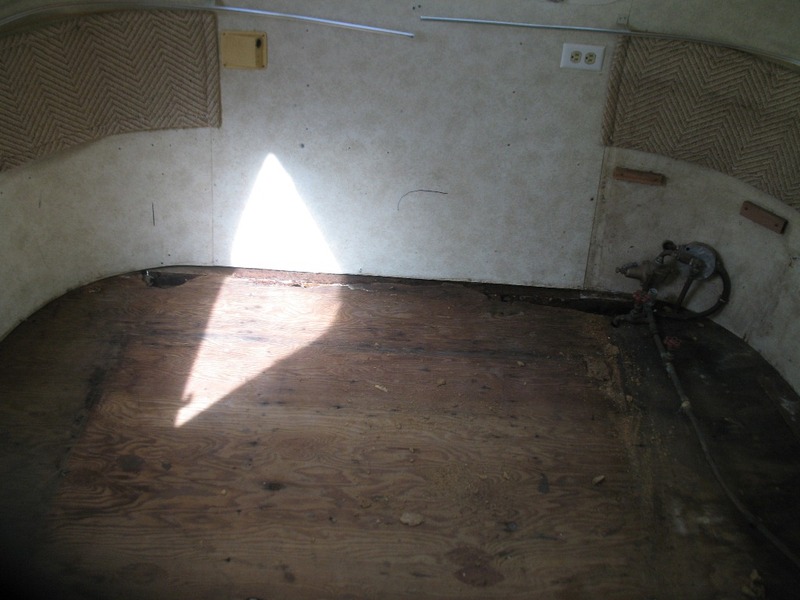 We painted the sub-floor with an oil based KILZ low odor product that has worked pretty well. 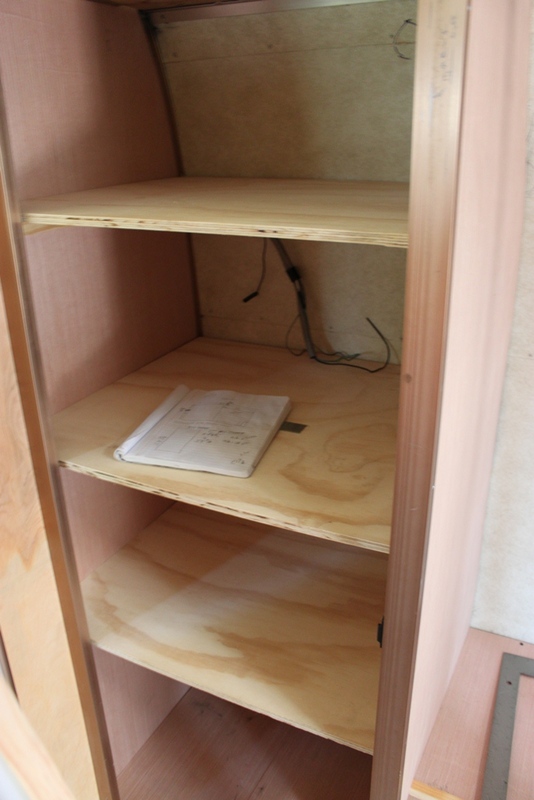 The new cabinet frames and doors are built out of select pine and will have a really nice cabinet grade paint that should help give them some durability. Trim will be added to the front of the shelves and we have some really nice nickle hinges and handles that should finish things off nicely. I will be spraying everything myself with my DeVilbiss FinishLine 3 gun once I finish building the couch and kitchen cabinets. 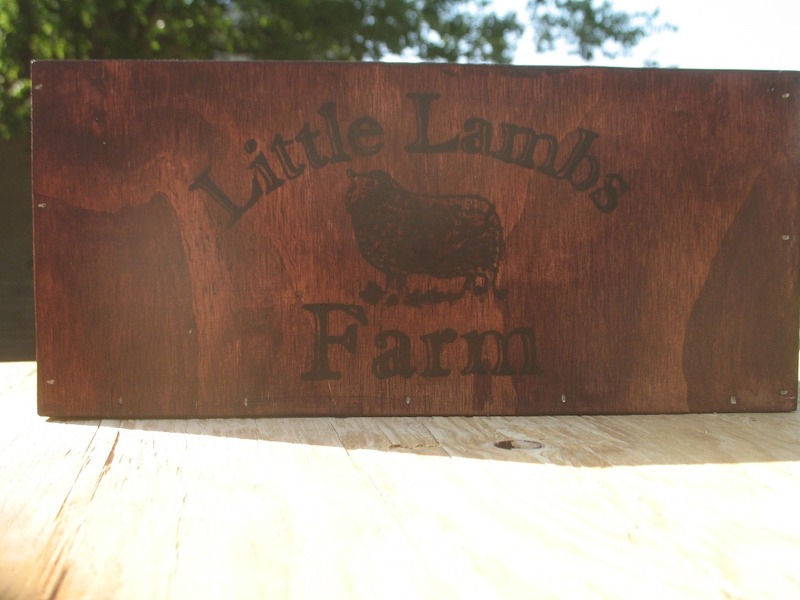 My wife finished these great herb boxes that we will mount on the living room side of the fridge wall (transfer and then stained). They will not be for herbs, but will be a nice touch! We decided to go with a walnut colored laminate flooring that is going to look incredible. 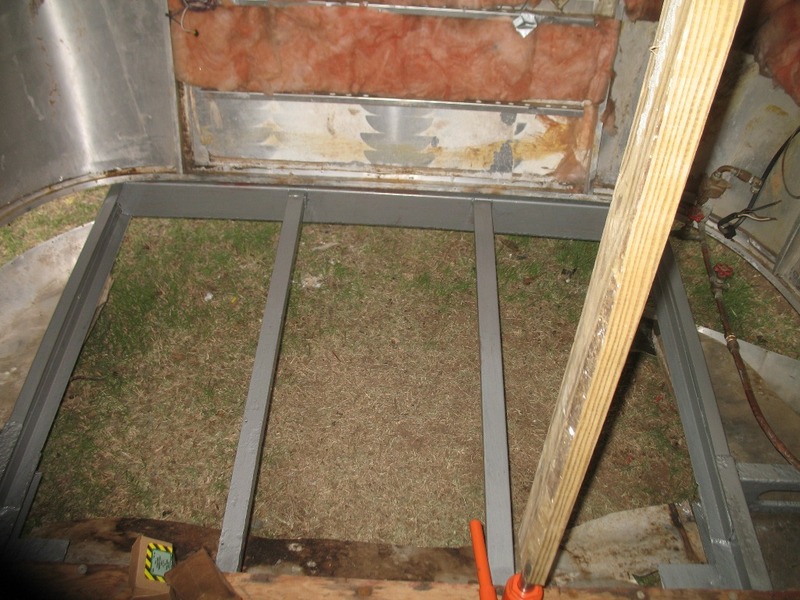 You can see a plank of it in the picture above of the couch area. 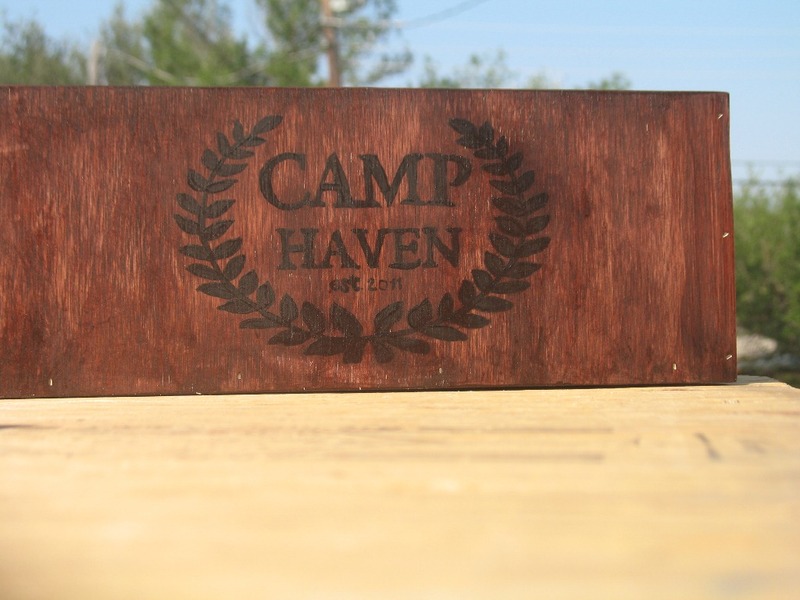 We wanted something that would be very durable, look great, and be very easy to maintain. 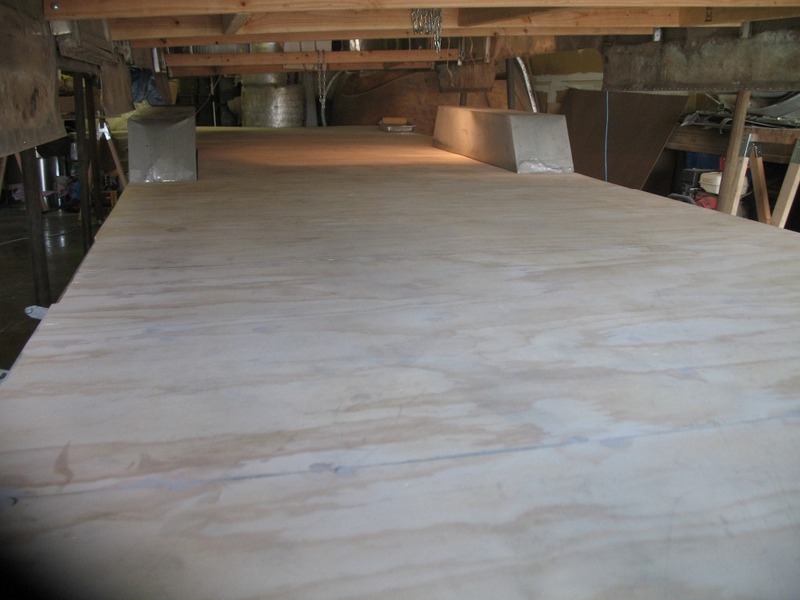 This stuff has a really thick padding and should be really nice installed as a floating floor. I am still trying to get caught up, but here is a picture of the first time the ’67 was pulled after the shell-off restoration. This trailer still needs all new insides, but everything else is in incredible shape. 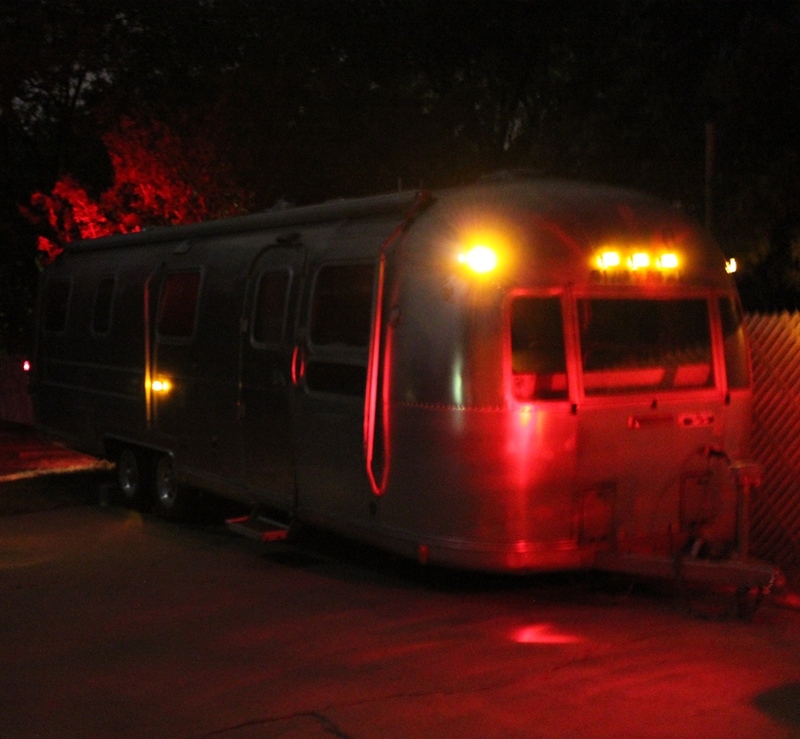 The trailer pulled like a dream. 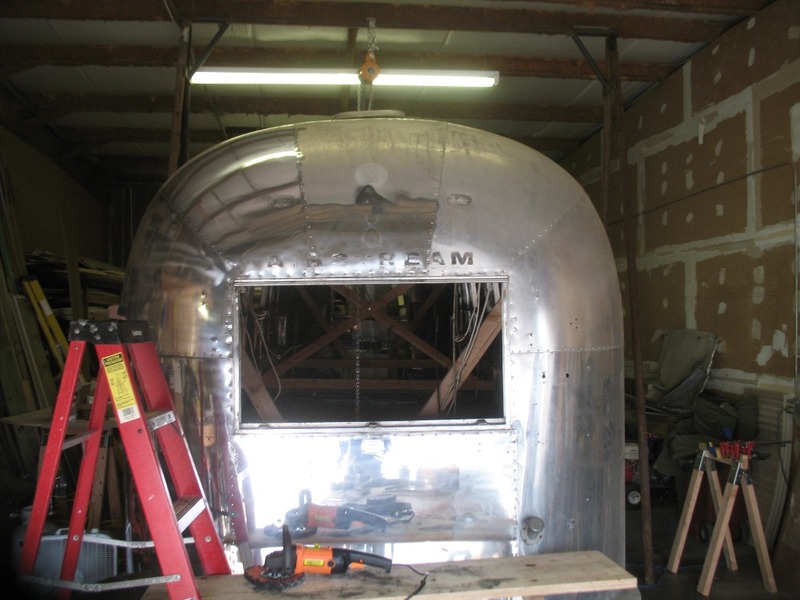 We currently have this trailer in storage until I can finish off a few other projects and find the time needed to dedicate to rebuilding the interior. Well, it has been a long time since the last update, but not for lack of progress. I actually misplaced the camera I use for this project and needed it to complete this update! 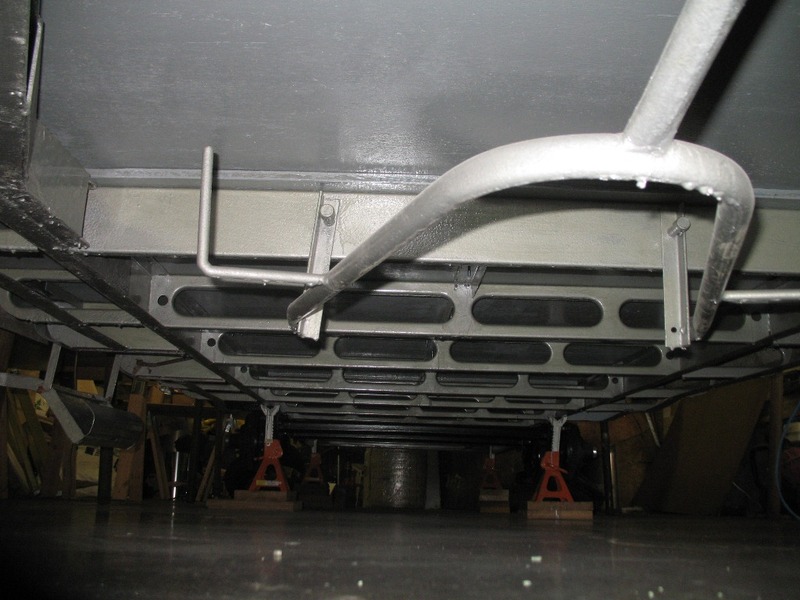 Here are the long overdue pictures of the finished work of the rear-end separation repairs. 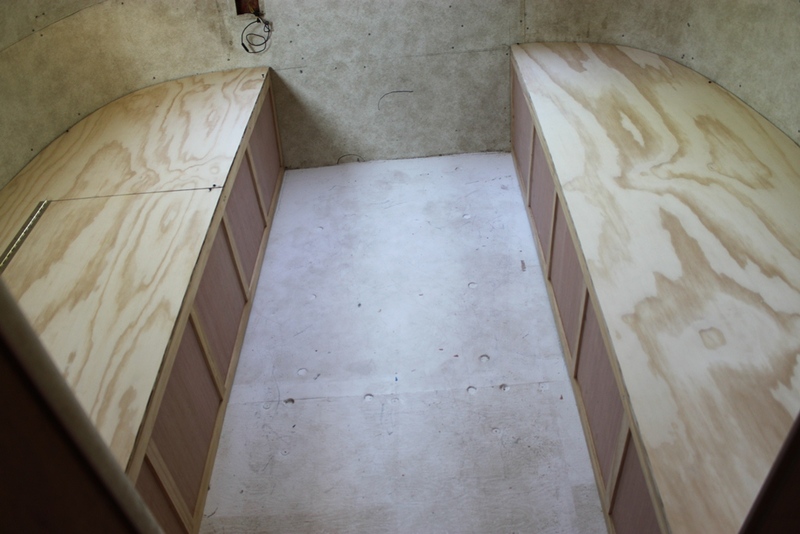 It turned out really nice and after many rain storms I can tell you that the rear area is the most water tight area in the trailer currently! 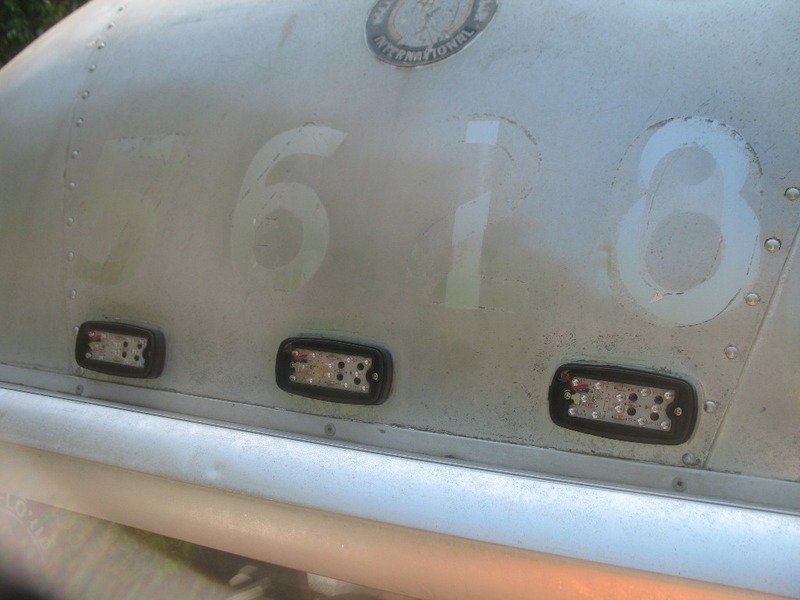 The other project that has been done for some time, but no camera to prove it are the new LED running lights. 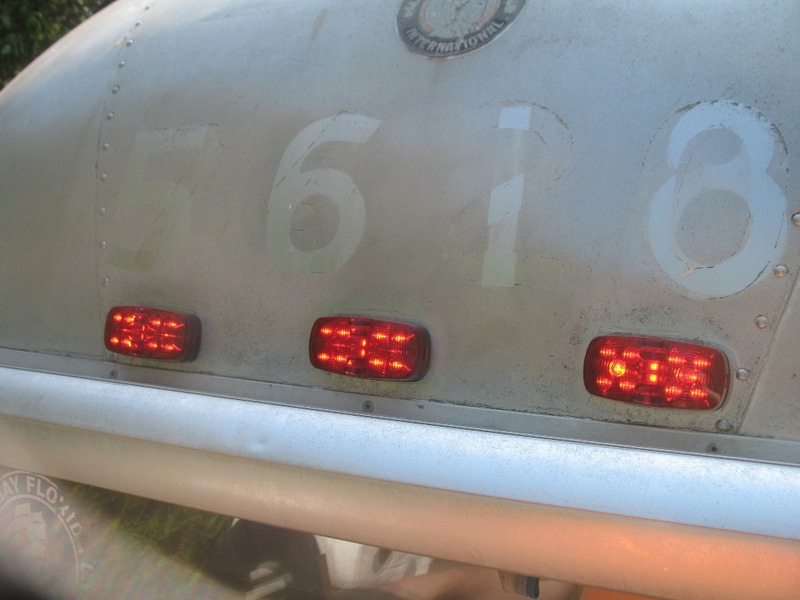 We replaced all of the tail light covers as many were broken, but currently those are still using the normal bulbs. I purchased the LED lights from superbrightleds.com and could not be happier with the results. 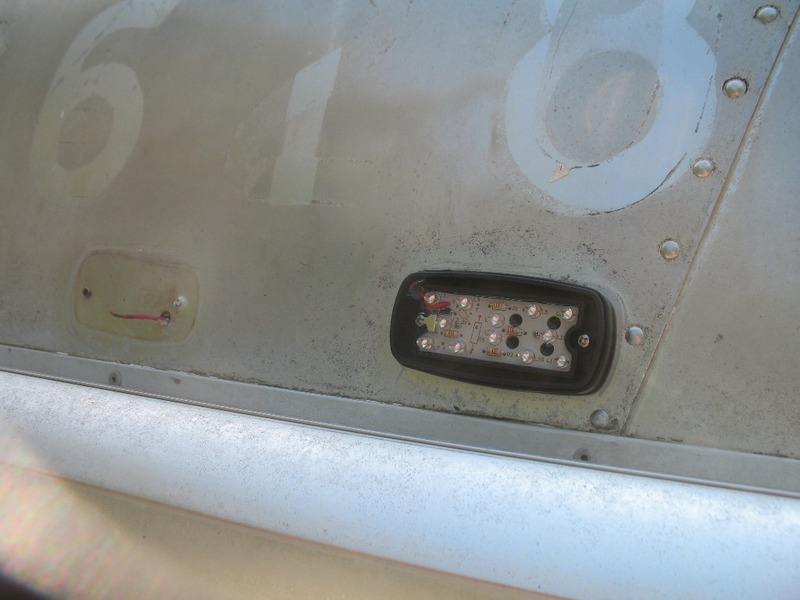 Here are a few before and after pictures of the front running lights. The old and new wire were soldered together and then heat shrink was applied over the exposed wires. 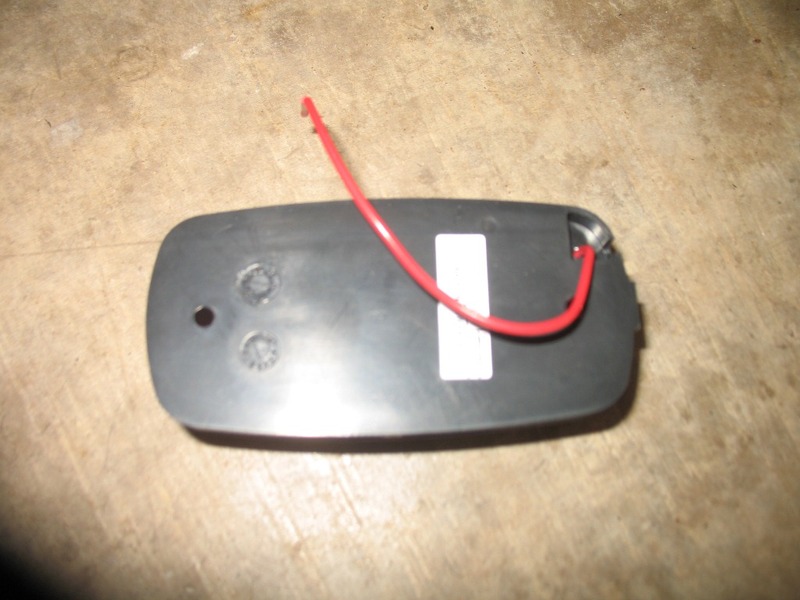 There were times where the wire from the LED was on the opposite side from the original lights, so a little channel was made using a Dremel tool. 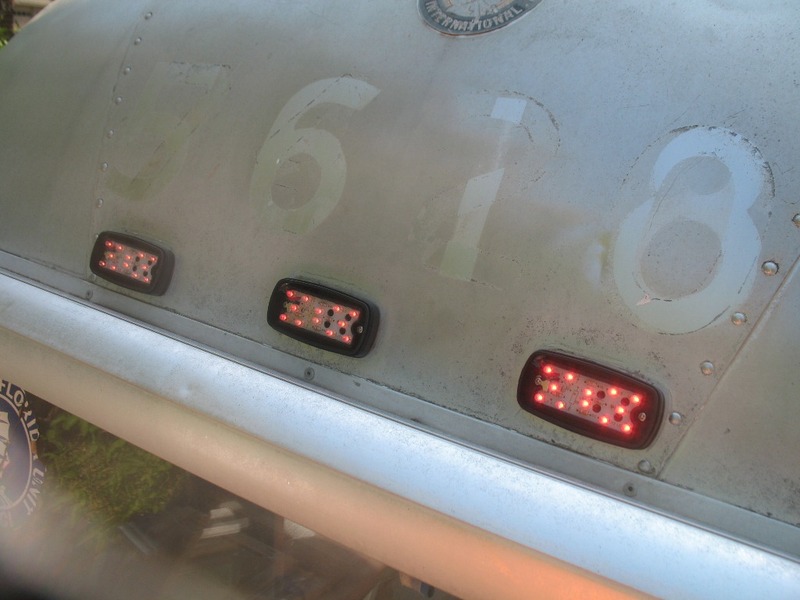 And finally here are the play-by-play pictures of the rear running lights. 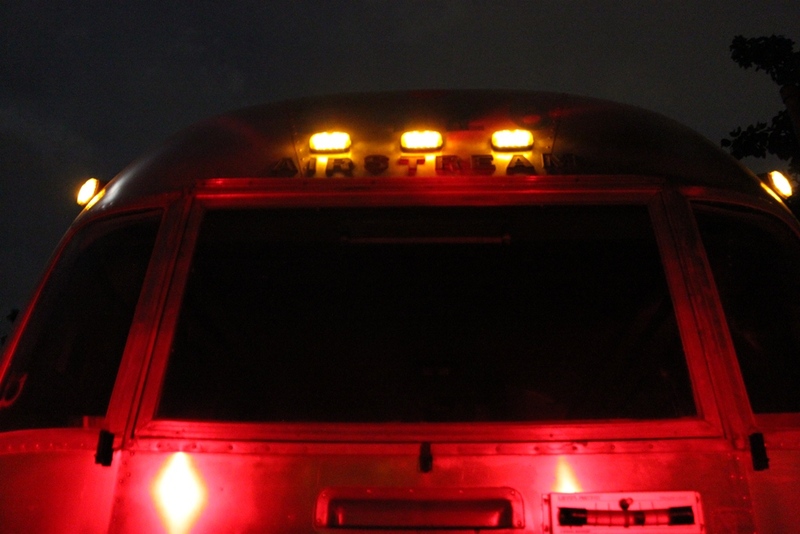 The new running lights look great during the daytime, but they really stand out at night! Well, that is it for tonight and I will post more updates on the ’77 and ’67 this weekend. The ’77 now has all new cabinets, axles finally shipped today, and the ’67 made the maiden voyage to her new home until I can finish up the ’77. 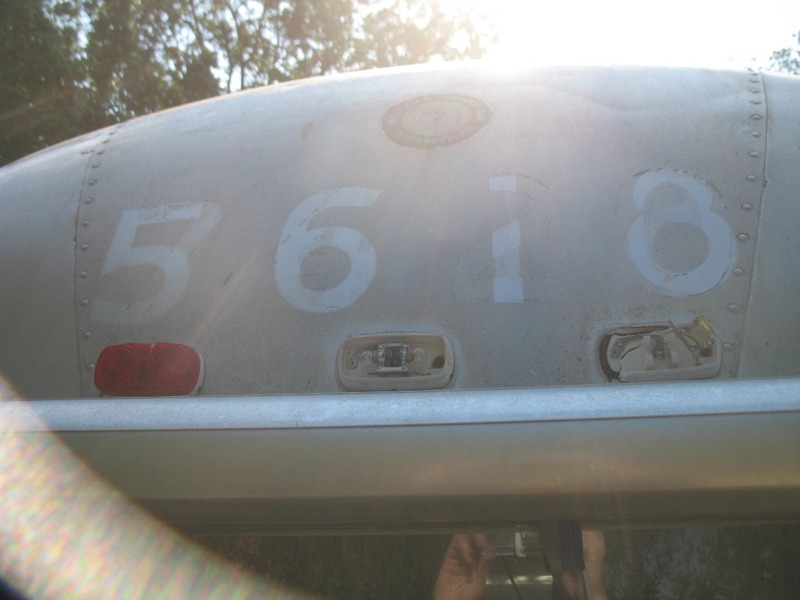 About three weeks ago we decided to do the “bare minimum” to get the ’77 safe and road worth so that we could use it this summer while the ’67 is still a long ways from being ready. 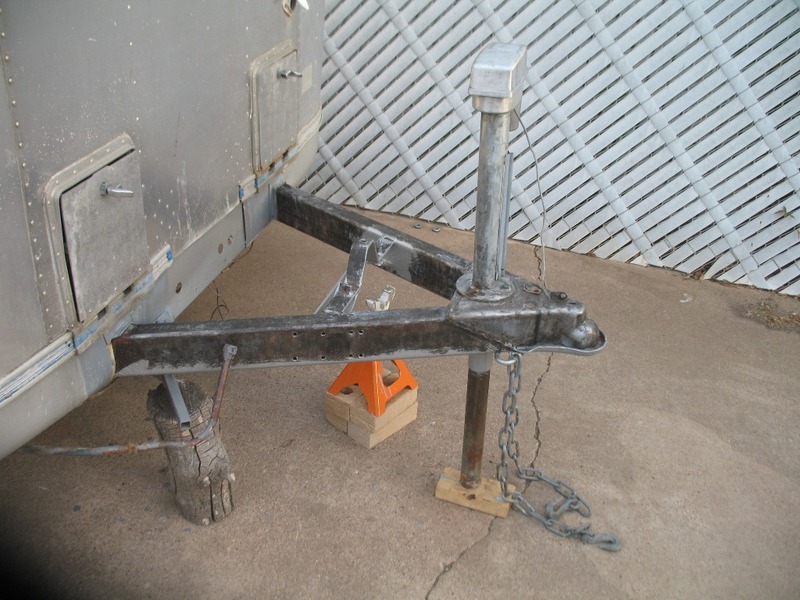 The axles had as negative of an arm position as possible so we ordered new axles that will actually be custom manufactured for this trailer today. I went with Axis axles through Colin Hyde this time with 10″ brakes. 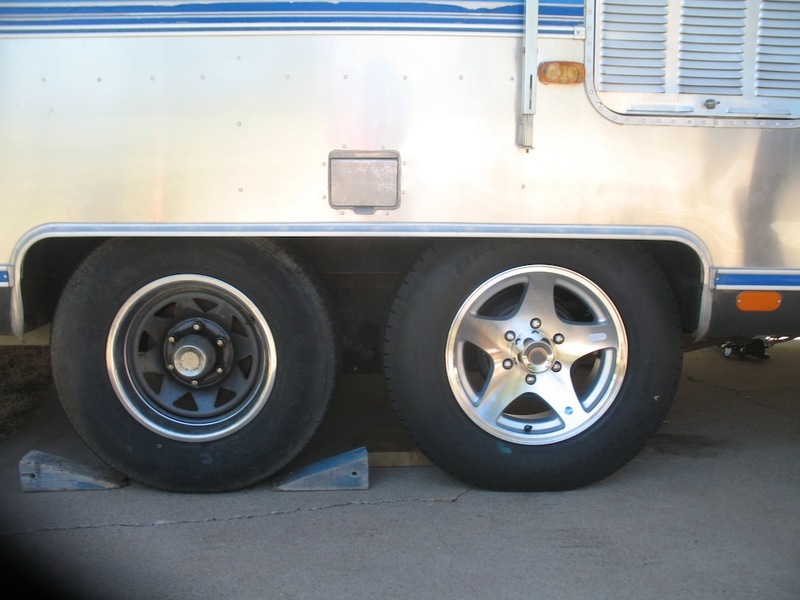 We were missing one of the original wheels, so it was a perfect time to upgrade from the original 15″ wheels to 16″. 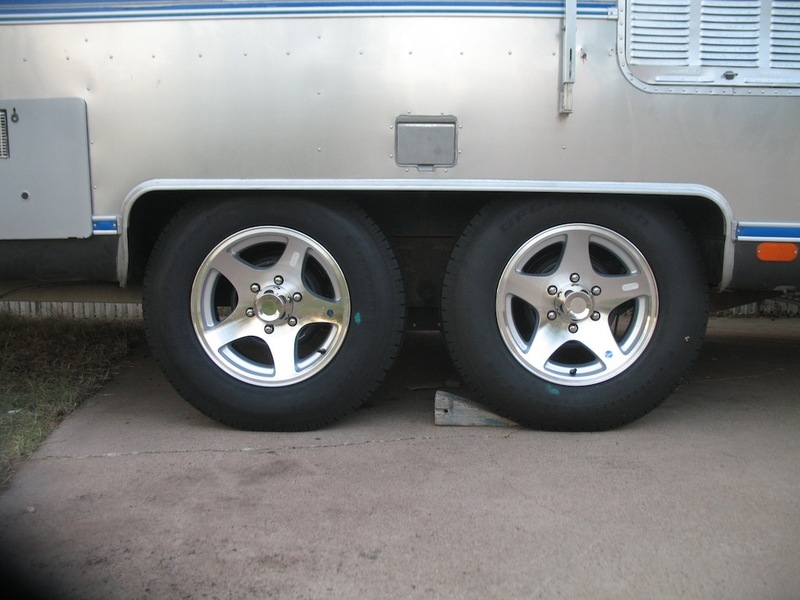 This gives us a lot of good tire options, instead of just one or two D rated tire options with the 15″ wheels. I ordered HWT series 4 aluminum wheels and BF Goodrich Commercial T/A All Season E rated tires. These tires have lasted other Airstreamers for 80,000 miles without any issues, which is better than all of the 5,000 mile Goodyear Marathons that everyone has issues with. The wheels are here and I’m just waiting for UPS to deliver the wheels. 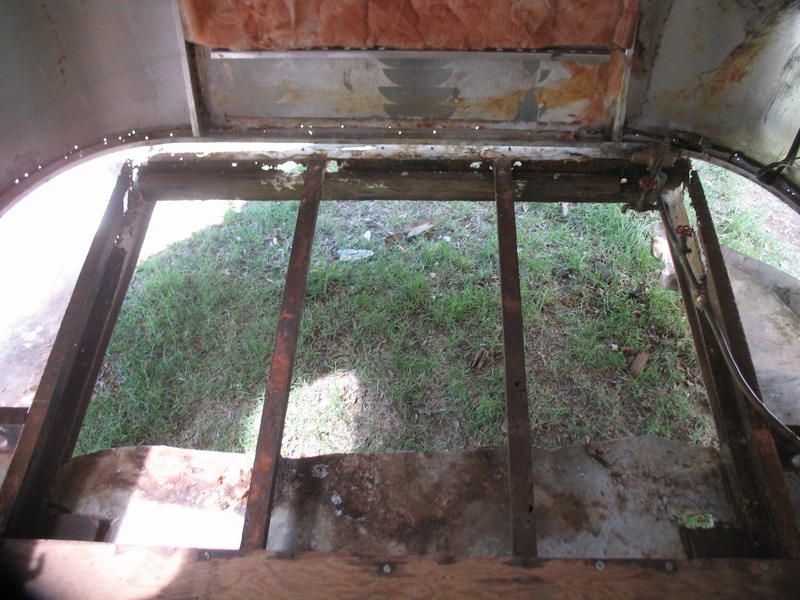 The rear 3-4 feet of this trailer had sub-floor rot and also serious frame rot. 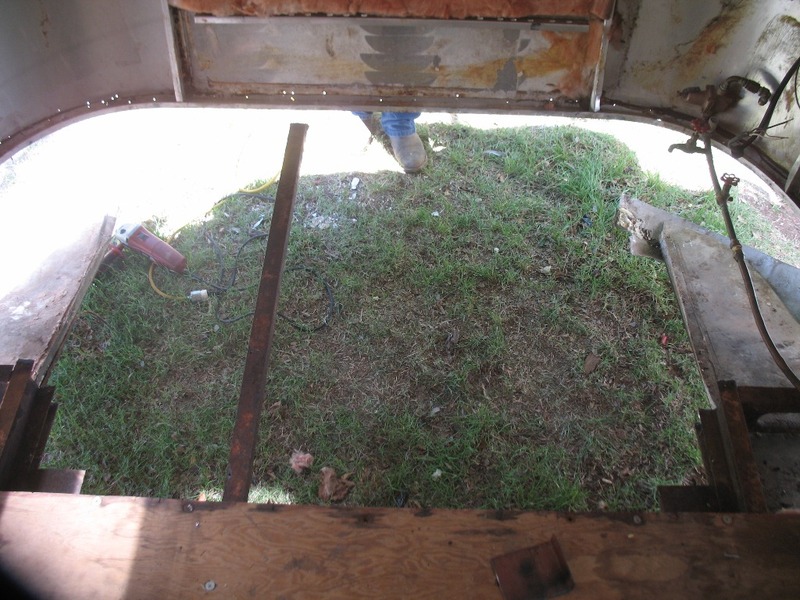 We removed the last piece of sub-floor by jacking up the shell off of the good sub-floor/frame and pulling out the bad sub-floor from the rear of the trailer. 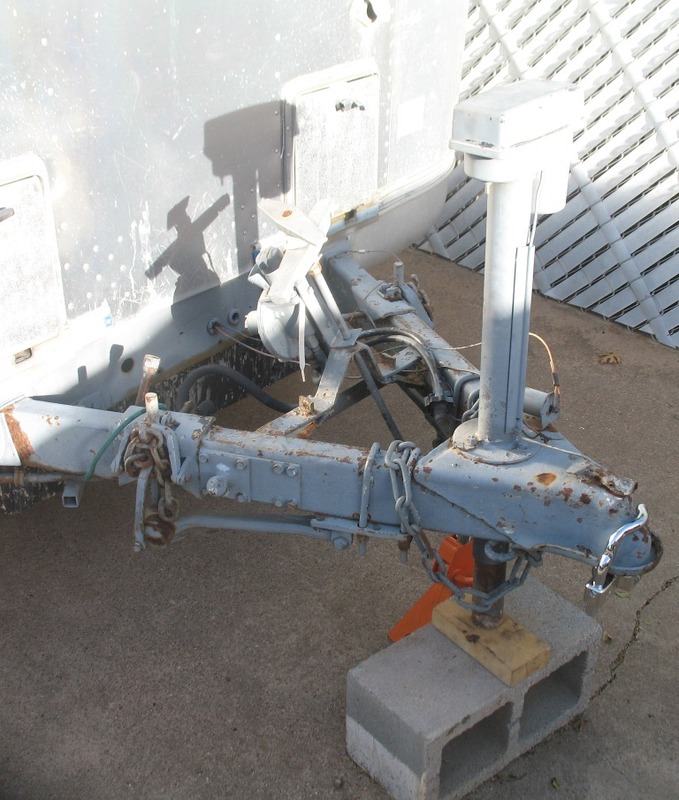 The damaged portion of the frame was then removed, replaced, and POR-15 was applied. The new section of floor actually went into place without much fighting and is now fasted to the frame. This week we will close up the banana wraps and put the bumper back on. The tongue looked really horrible and a PO had built a wooden box around the spare tire holder. The tongue has since been cleaned up and received an initial coat of POR-15. The spare tire box was removed and the nice spare tire holder also received a coat of POR-15. 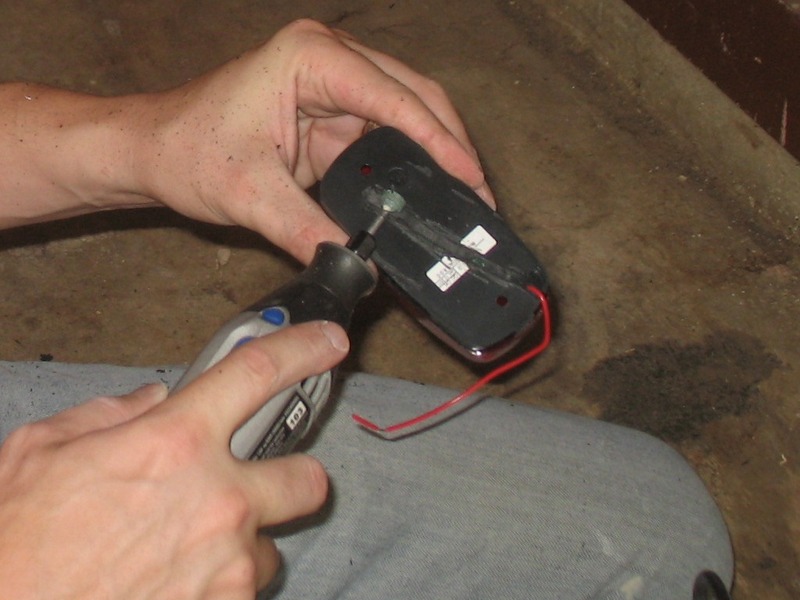 The electric jack was not attached to any existing wiring, but it is in great working condition. There was a really odd looking pan under the living room floor and upon further looking it turned out to be some type of air tank that I believe was used for hydrolic brakes at some point. 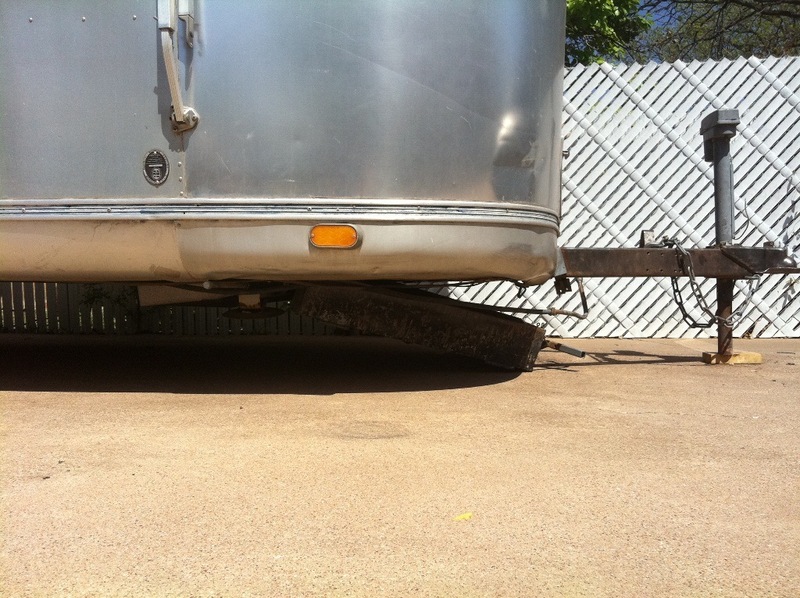 This thing had electric brakes from the factory and did when I bought the trailer. Some things will never be 100% understood. The fresh water tank was dropped, sanitized/cleaned, and is now ready to go back into place. 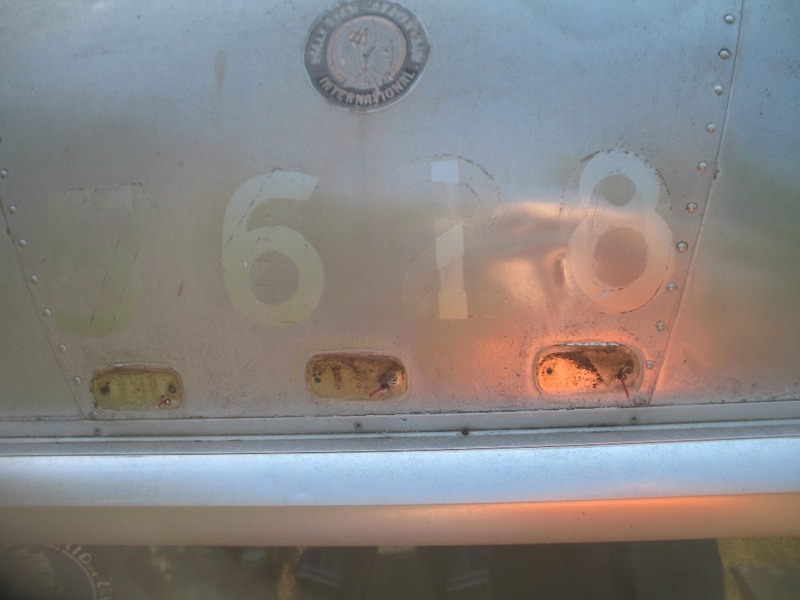 We had to repair the main bracket plate as it was really badly rusted, but now should hold up just fine! I will post some pictures once we put it back in. The old AC was DOA and so we removed it and have a new 15,000 BTU Carrier heat pump unit waiting to be modified for the drain line. This unit should work out great and I’m looking forward to getting it installed. Three new Fan-Tastic vents are on their way and will be great on those not so hot days. 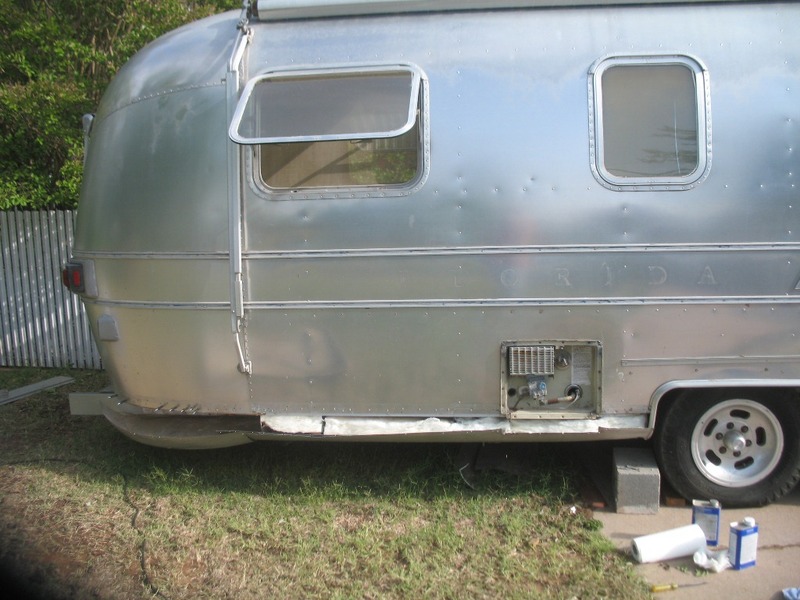 The biggest news has to be that the shell is now back on the ’67 trailer and turned out great. There was absolutely no good curve to go off of on the rear so I was a little worried (the sub-floor was completely rotted, the c-channel was broken and bent in three different places, and there was a big dent on the street-side skin right next to the utility door). The shell is now attached much more securely than it was from the factory and the lines look really nice. Things have been very busy lately and thus a very late update on last week’s progress is included in this week’s update. After getting the floor dry fitted we drilled all of the holes for the elevator bolts and then went ahead and countersunk those holes. 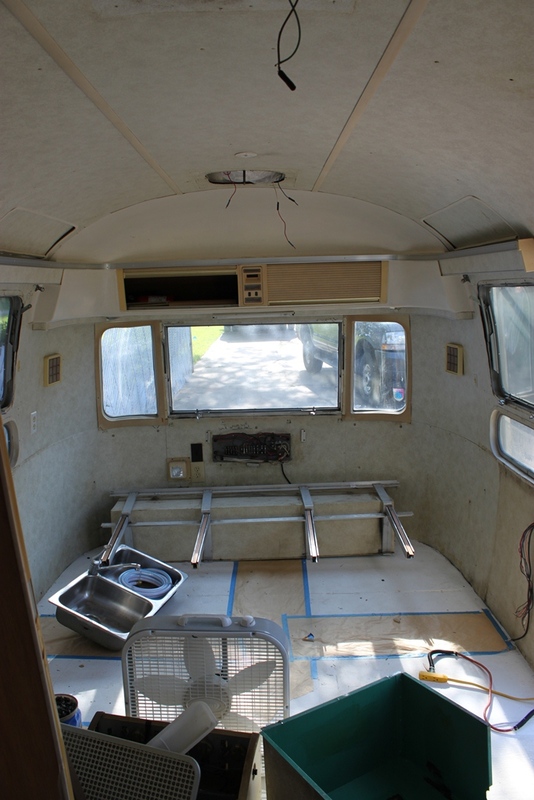 The sub-floor was then removed and flipped over for the first coat of floor paint on the bottom and all of the sides. 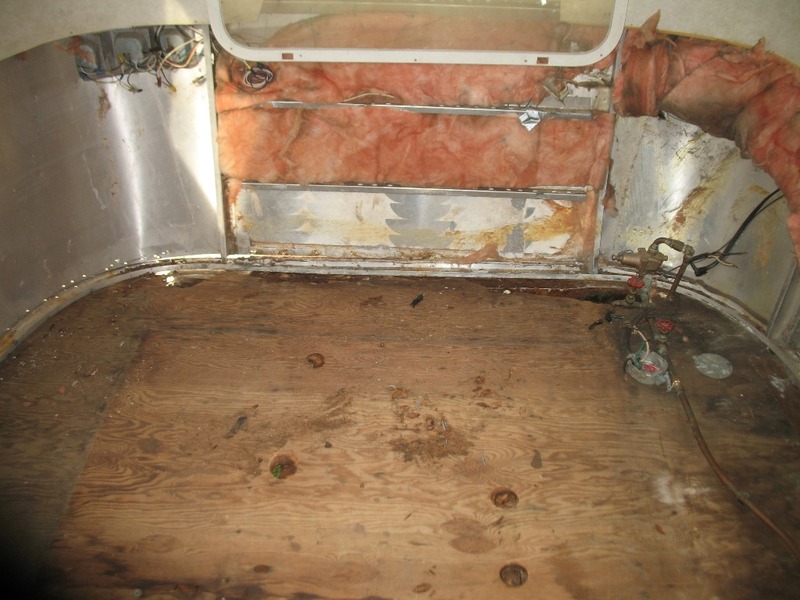 The sub-floor was then installed and all bolts and nuts tightened for their final time. The floor fits really nicely and the only issue we had was needing to adjust the street-side wheel well area to fit a little better. 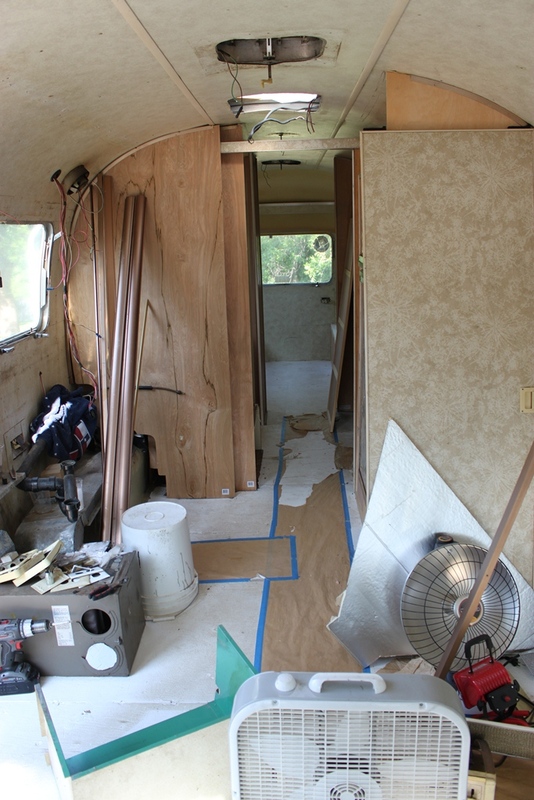 The POR-15 and the painted floor looks really nice together and all is ready for insulation now under the floor! 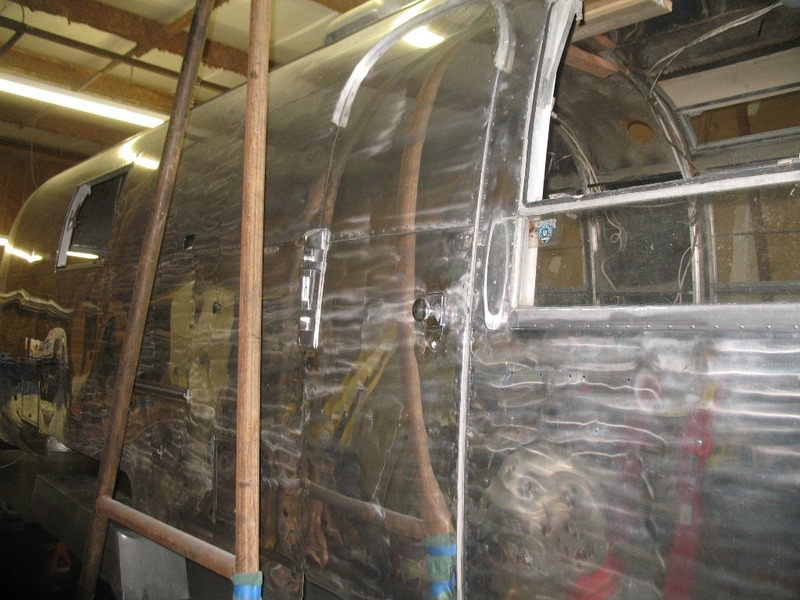 The process of polishing began and we started on a corner panel that we are going to be replacing because it has damage that is too severe for repair. We are using a brown and then white rouge on a variety of 6″ polishing wheels. We tried black and use that on some of the areas in need of more help and also even tried some green. The brown and then white passes seem to give the best results. The end results were incredible! 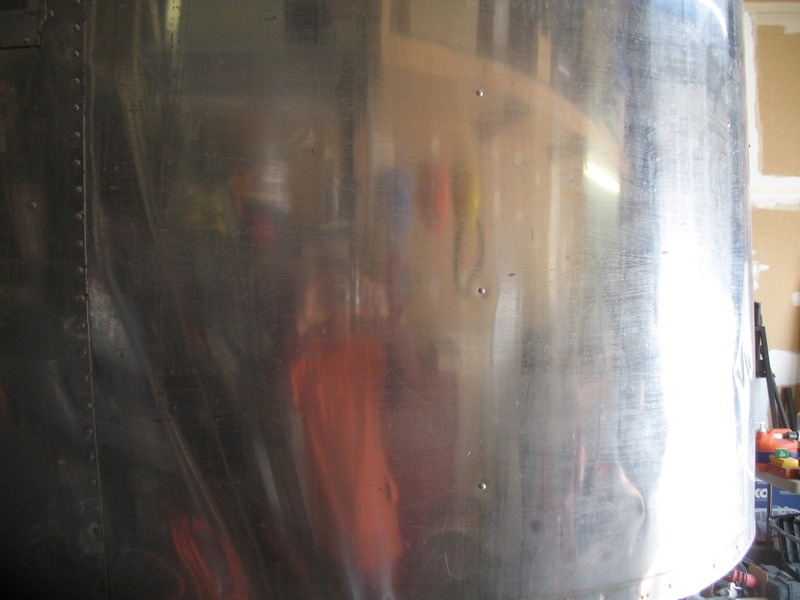 We have since damaged this panel even futher as we tested wet sanding to remove some of the deeper scratches that even the black rouge couldn’t touch. 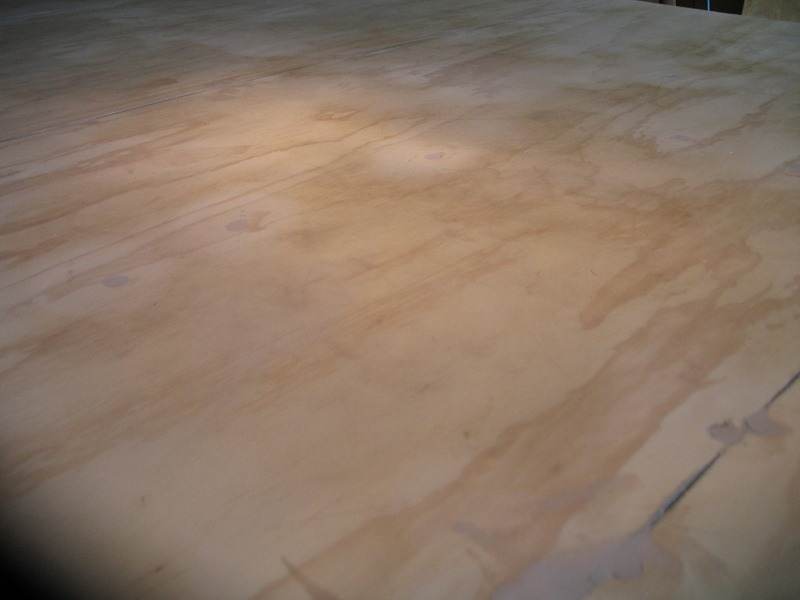 The end story is that even very fine wet sand paper is a no-no. 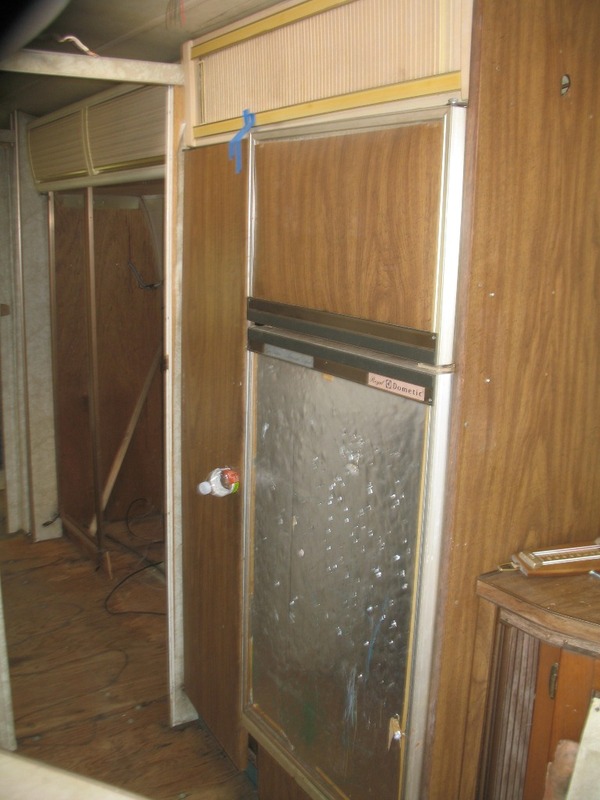 This is a 44 year old trailer so it is still going to have scratches since I don’t plan on replacing every panel and some scratches add to the character of this vintage trailer. This first few stages of polishing is only an 80% polishing and we will finish it off down the road with a few passes using a cyclone polisher and Nuvite. The PO had at some point used silicon around almost every window so the current fun task is to remove all of that as it makes polishing a nightmare and we need to fix those windows. The curb-side has had a full pass of brown and will get a pass of white soon. 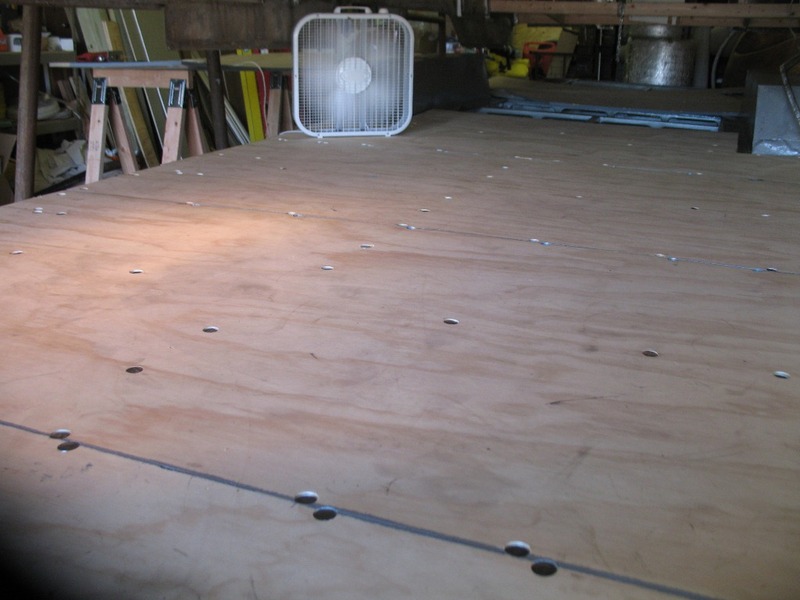 The floor is ready for the shell as soon as we install all of the c-channel. 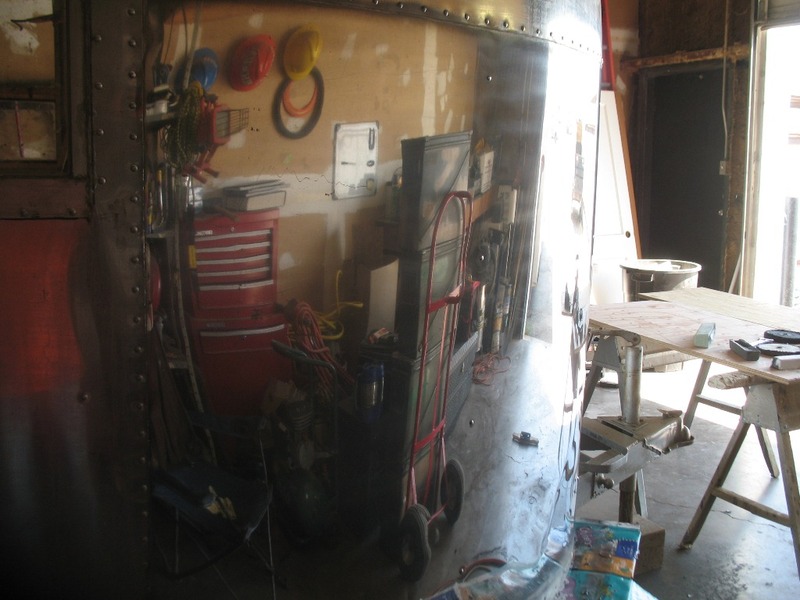 I still need to fabricate a new banana wrap for the street-side front before we can once and for all attach the shell. 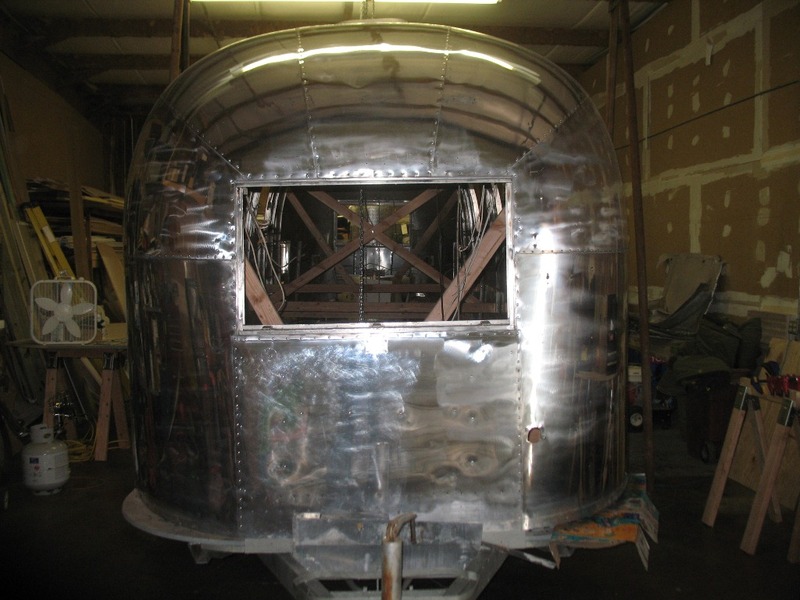 The aluminum for the belly pan and a few panel replacements is sitting in the shop waiting. The next few weeks should be productive. 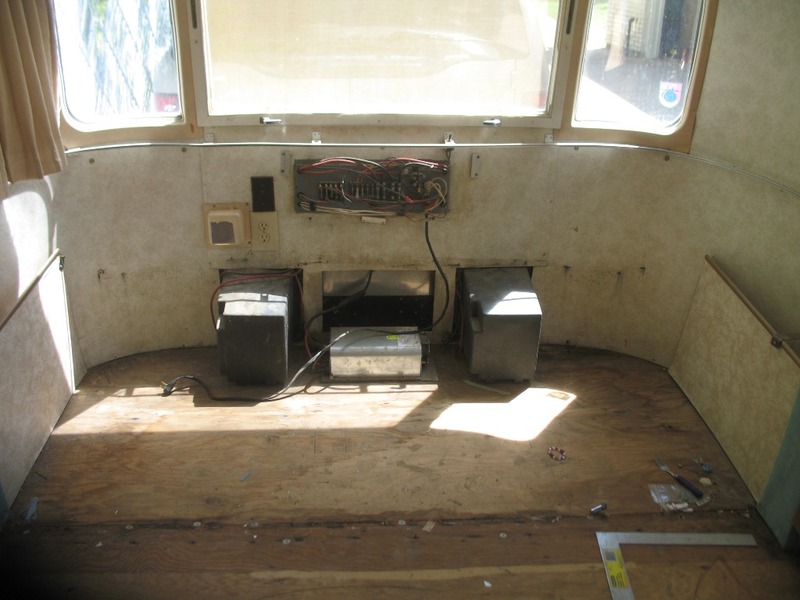 We are now in a race to get this thing put back together by the the beginning of May as we would like to use it to do some camping as we take our time finishing off the inside. We will be very close!